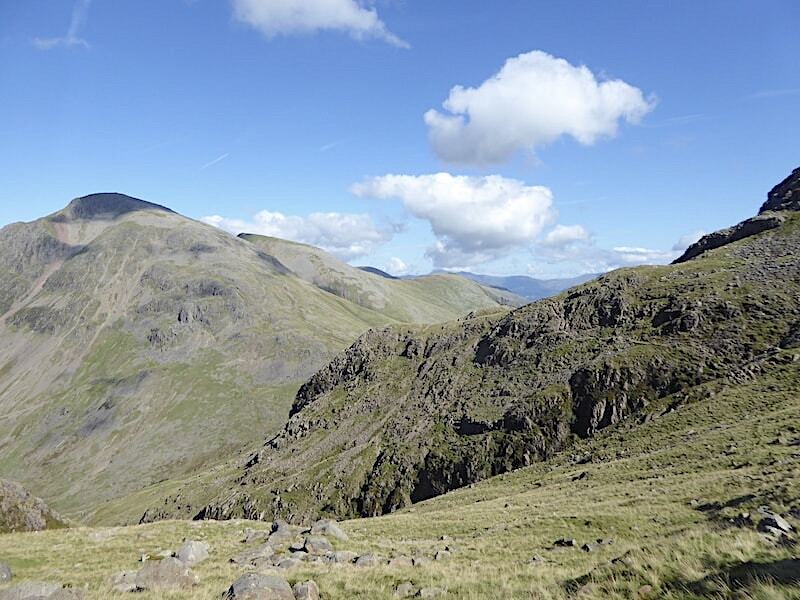 Regular visitors may recall that a little while ago we resolved to make the effort to revisit those fells which we have neglected for far too long. 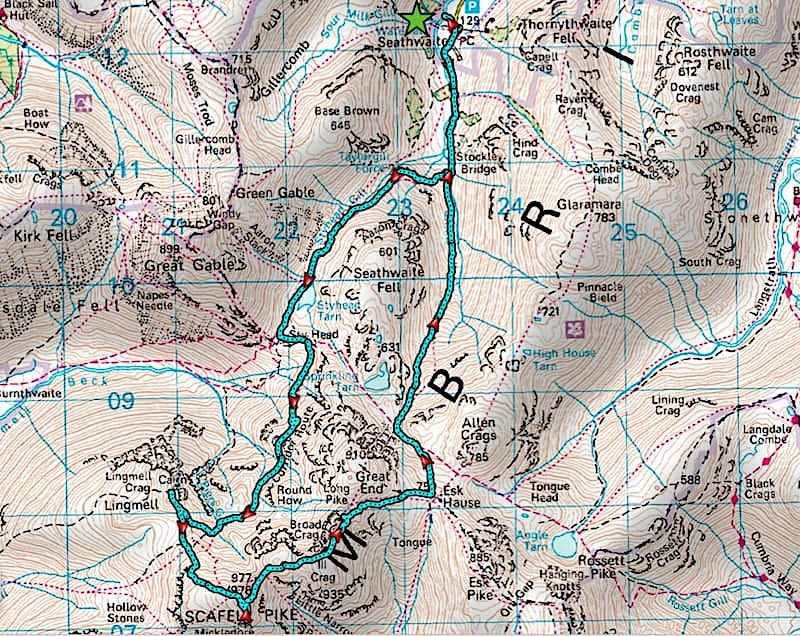 This resolution hasn’t been forgotten just briefly interrupted for a variety of reasons but, as the forecast for today promised a really favourable day, we got ourselves back on track with today’s walk across the Corridor Route up to Lingmell and Scafell Pike. 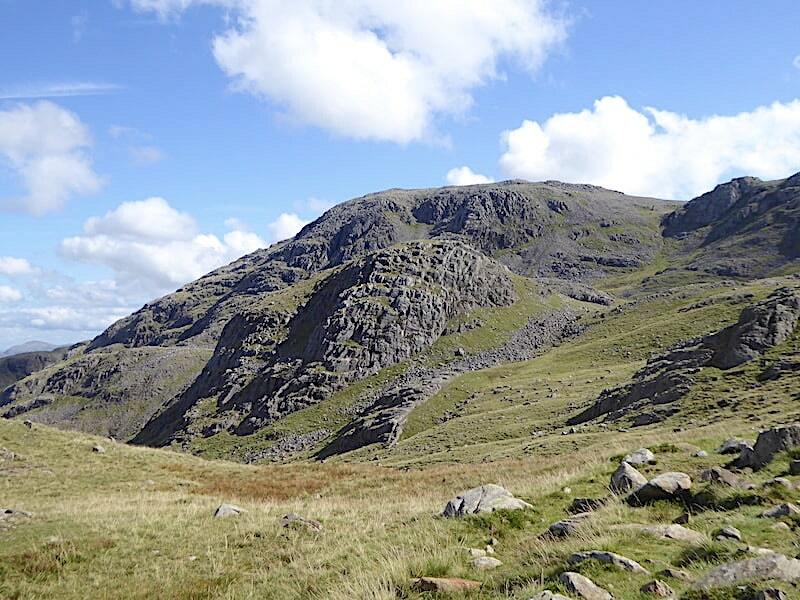 AW devoted about thirty pages to Scafell Pike in his guide to the Southern Fells and there’s very little I can add to his extensively detailed pages and descriptions. 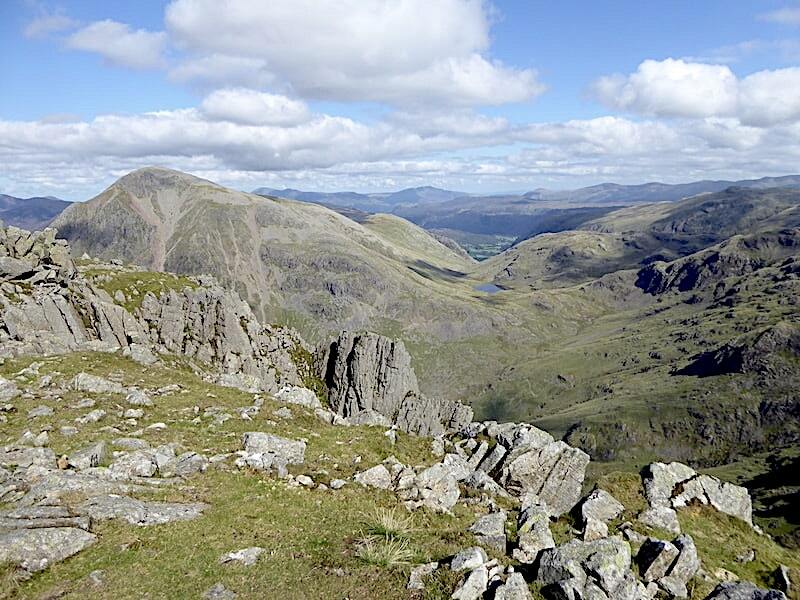 Sufficient to say that, although it is long and often arduous, this is a magnificent route, full of interest and variety, and the scenery around it is breathtakingly impressive, a fitting approach for a walk up to the highest peak in England. 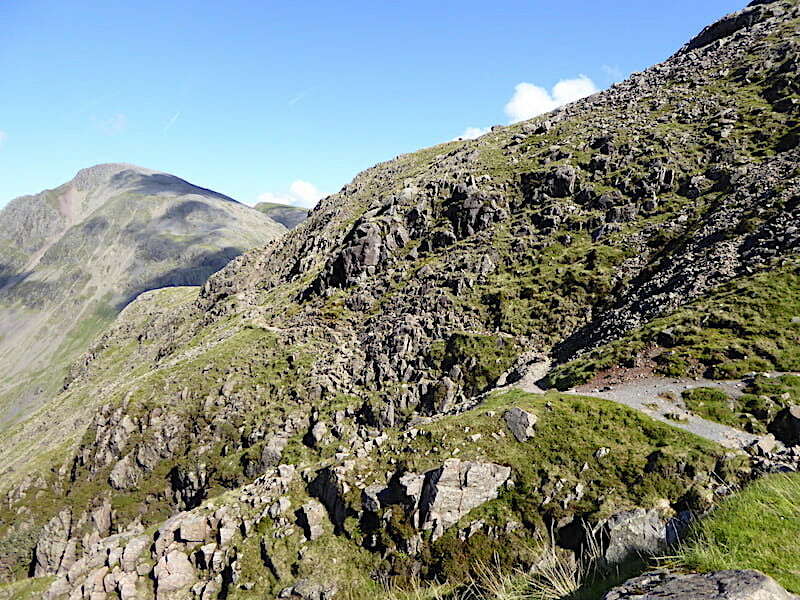 A good few cars were already parked along the lane up to Seathwaite Farm with walkers getting themselves ready for their day’s walking. We had already decided that we would take advantage of the field parking offered at the farm, at £3 for the day, so we drove straight up the lane and were just about to go through the gateway and turn into the field when an enormous tractor, with a large trailer full of sheep, came towards us from the farm and reached the gateway just ahead of us. Not wanting to tangle with the monster we pulled into the turning circle and checked with the driver that the field parking was still available. “Aye, park up agin’t back fence and put money in’t one o’t boxes,” and with a smile and a wave off he went down the lane. I hoped for their sakes that everyone had parked well back off the road because the tractor and trailer took up the whole width of the narrow lane. Having parked up “agin’t back fence and put money in’t one o’t boxes” we kitted up and set off up the track towards Stockley Bridge bang on 8.15 a.m. Its a lovely sunny morning but we’re still in the cool shadow of Thornythwaite Fell so our jackets remain on, but unfastened, as we walk briskly up to the bridge where a pair of walkers are already crossing over. Below the sunlit top of Seathwaite Fell a group of walkers seemed to be having a little difficulty negotiating the slabby section of the path across there. We were to meet up with them several times during the day. 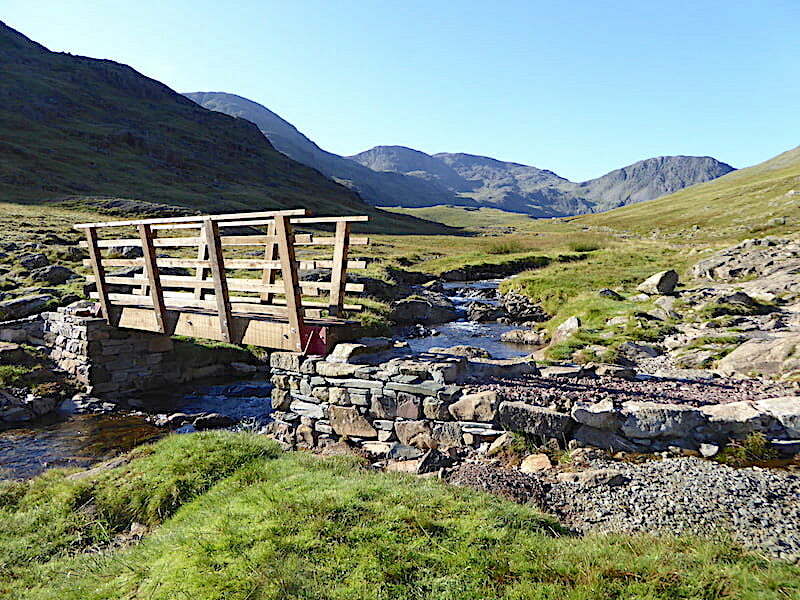 We cross the bridge, go through the gate and stop to remove the jackets, the brisk walk had done the trick and now we were nicely warmed up and ready for the climb up to Greenhow Knott. Greenhow Knott was soon reached and we had a brief stop to remove the lightweight jumpers we were wearing. 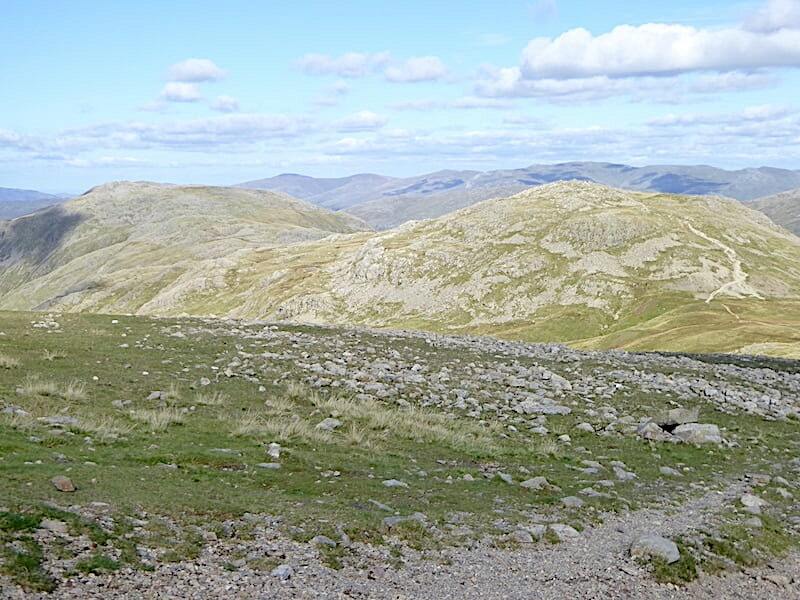 Just before reaching Greenhow Knott we had passed the two walkers you can see in the photo. The young woman had stopped to remove her jumper and the young man with her was clearly struggling with the climb. When they reached the point where we were de-layering they also stopped, sat on a rock and the young man began to remove his boots which must have been giving him trouble. We carried on a little way and then looked back to see how the pair were managing. Behind me, and waiting some distance ahead, were two more members of the group. One was a local English chap and the group’s guide, the other was another young woman. 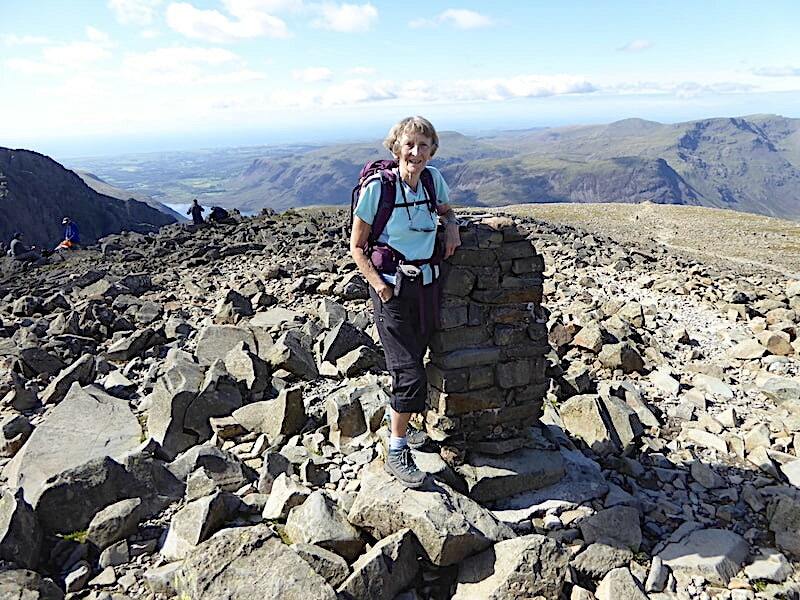 This lady and the two in the photo were Chinese, I think, and must have hired the guide to lead them up to Scafell Pike. As we caught up with the guide we told him that the young man was having trouble with his boots. He made no comment other than to say “Oh” in a way that suggested some concern about how this group would manage the rest of the walk with problems so early on it it. 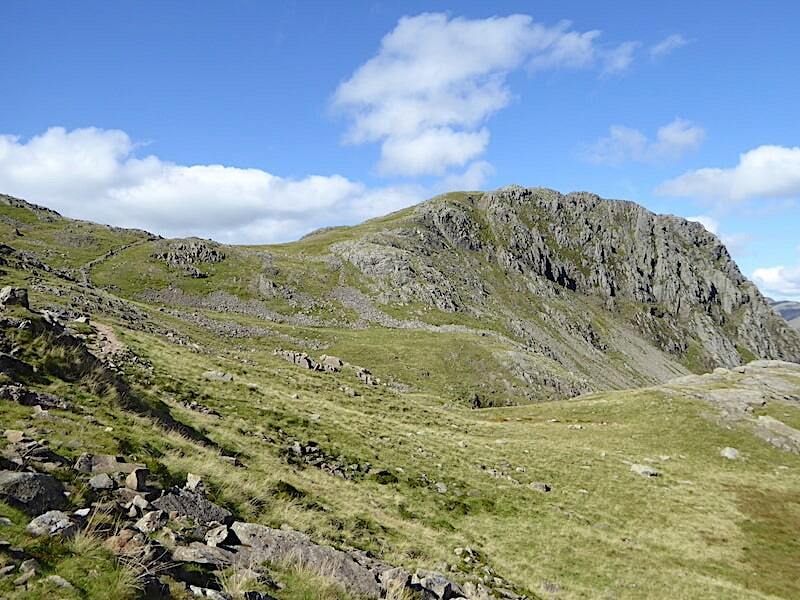 We leave the group far behind as we continue on alongside Styhead Gill. As we crossed the bridge we took a look back but there was no sign of them. At the pace they are going they’re in for a long day of walking. We weren’t walking swiftly either, we wanted to enjoy our sunny stroll alongside the gill before the next section of heavy lifting was upon us. Despite our leisurely pace we both had foreheads beaded with sweat as the morning heated up nicely. Styhead Tarn was deserted, as was the path both behind and ahead of us, and it felt a little surreal to have the place all to ourselves. 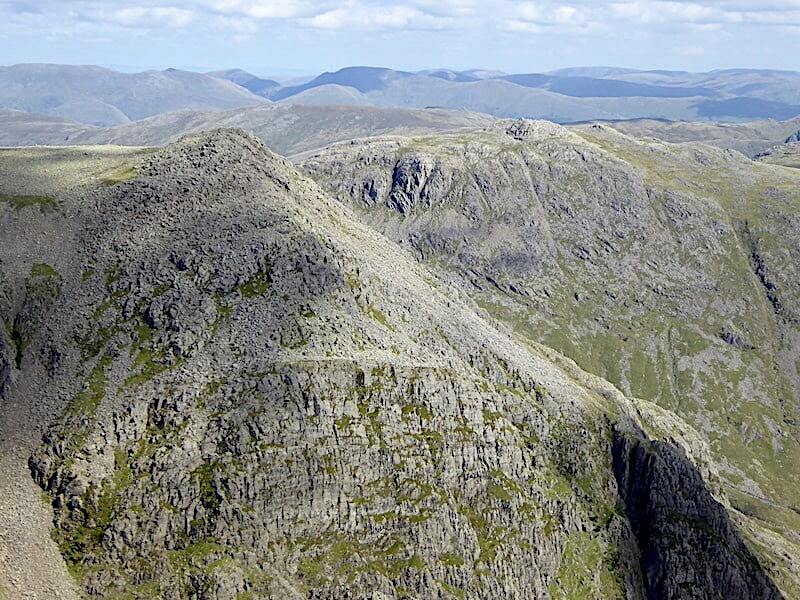 Up ahead we have a skyline view of Great End, Broad Crag, Scafell Pike and Lingmell. The heavy lifting department is waiting. 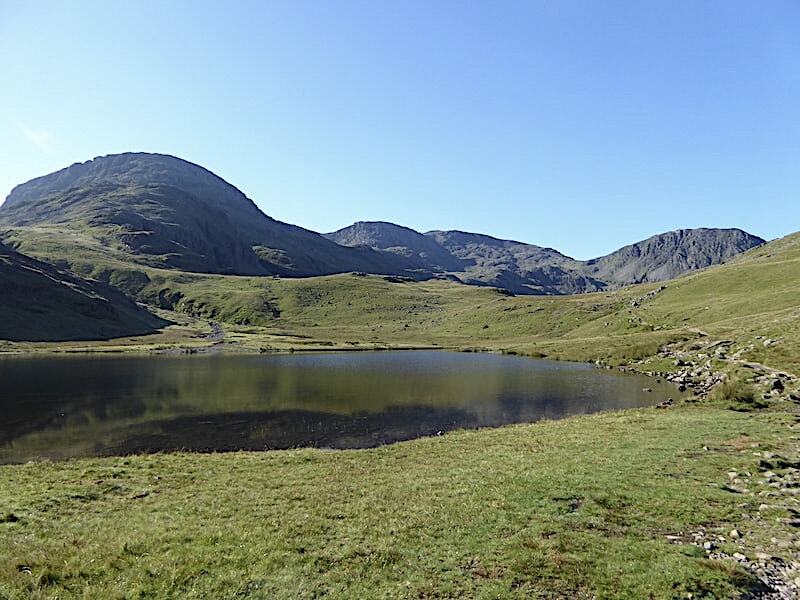 A look back at Styhead Tarn where a slight movement of air along the valley shimmered the surface of the tarn for a moment or two. Looking back along the route we could see no sign of the guide and his walking group so their progress must have been at a really slow pace. 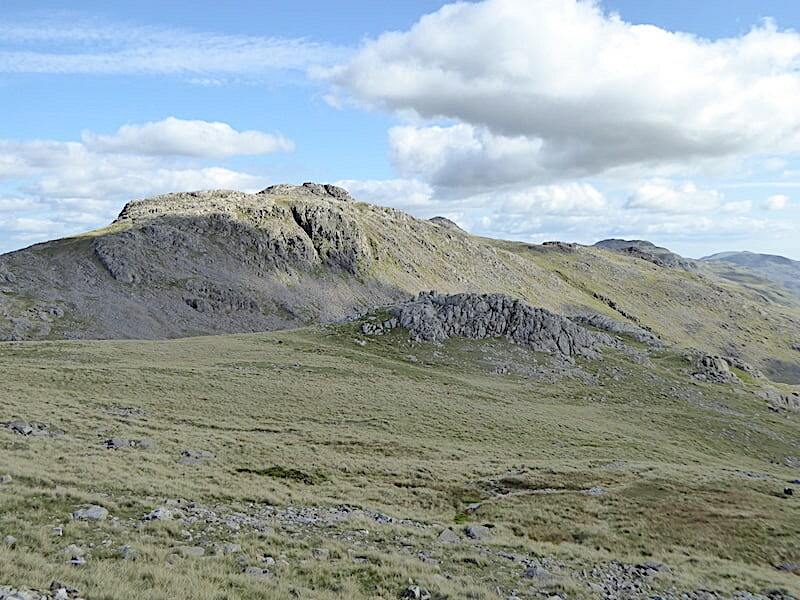 We had a short stop, aka the Mars Bar break, at the stretcher box at Sty Head, which was as deserted as the rest of our route so far. 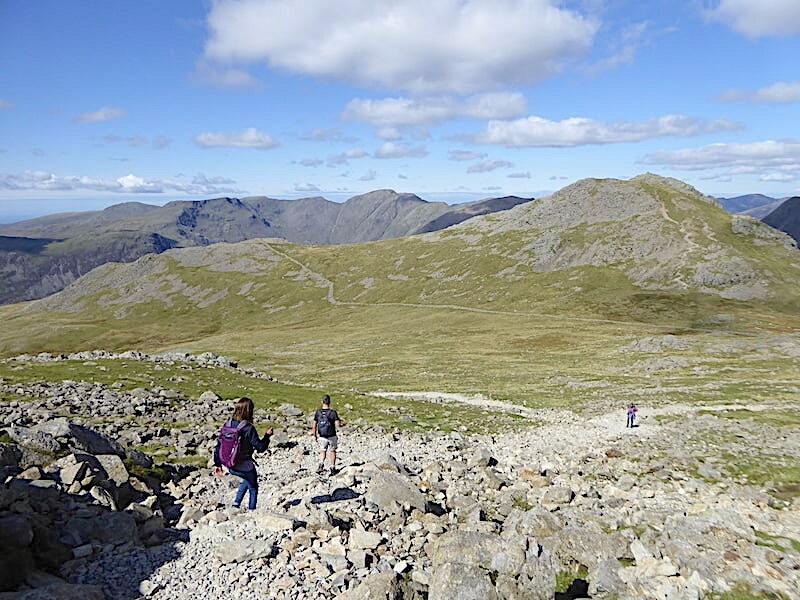 Break over and we hoist our packs again and set off on the Esk Hause path which we will leave after a short distance to join the Corridor Route path. 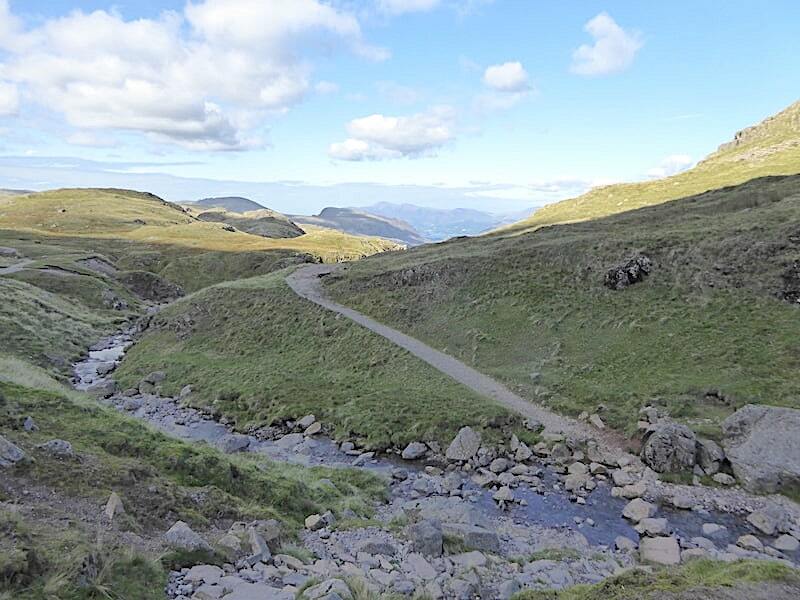 About halfway along the path in the centre of the shot we spotted two of the guided walk group just appearing over the rise of the Styhead Gill path and heading over to the tarn. They were the guide and young woman we had passed earlier, the young man and his companion were still out of sight and obviously still some distance behind. 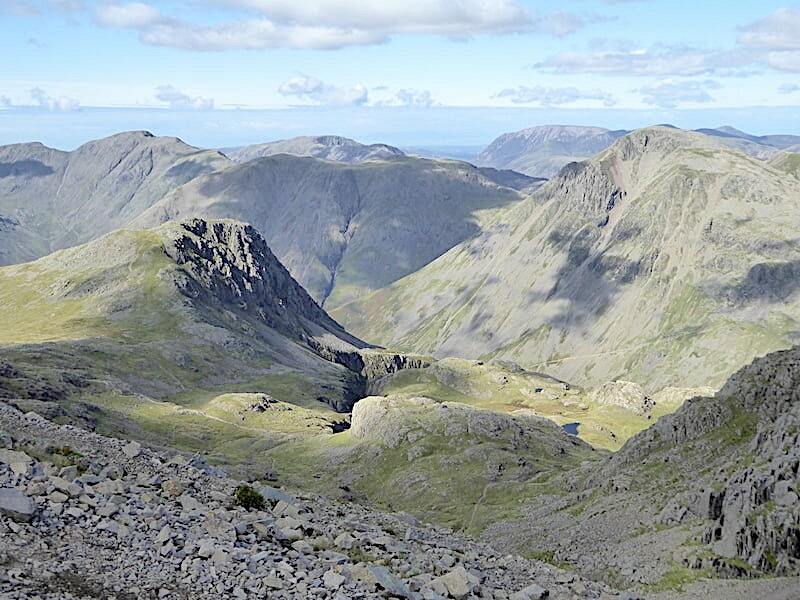 At the point at which we joined the Corridor Route path I took a look back for this shot of Great Gable and Green Gable with a few remnants of contrails gradually dissipating above them. 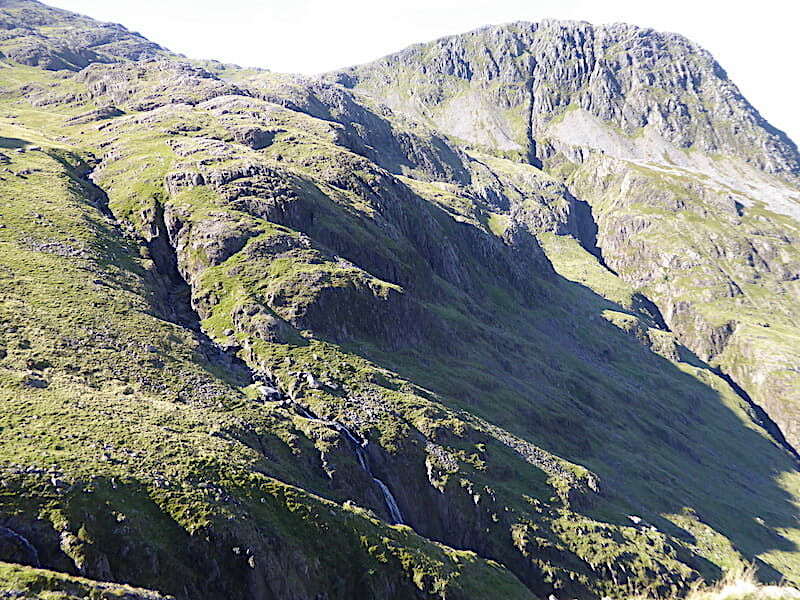 As we dropped down the path, somewhere below the steep dark crags of Spout Head, we heard a male voice shout out but looking around we could see no-one. We stopped and listened for a few seconds, in case someone was in trouble and shouted again, but we heard no more shouts so we carried on walking. A few seconds later we heard a loud noise, a dull thrump sort of sound, so we stopped again thinking it might be a fall of stones or rocks. 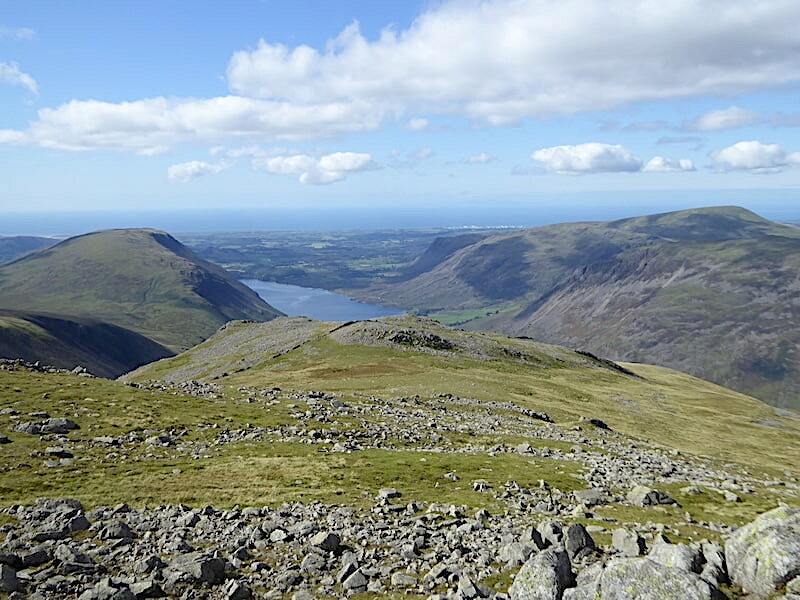 I was in front of J on the path and as I stopped and looked across at the crags I saw the top of a large blue paraglider canopy open up and then swiftly disappear from my sight in the direction of Wasdale, although the person hanging below it was hidden from my view. The shout we heard must have been a warning one and the dull thrump was the air filling the canopy as the person in the paraglider jumped off the cliffs. 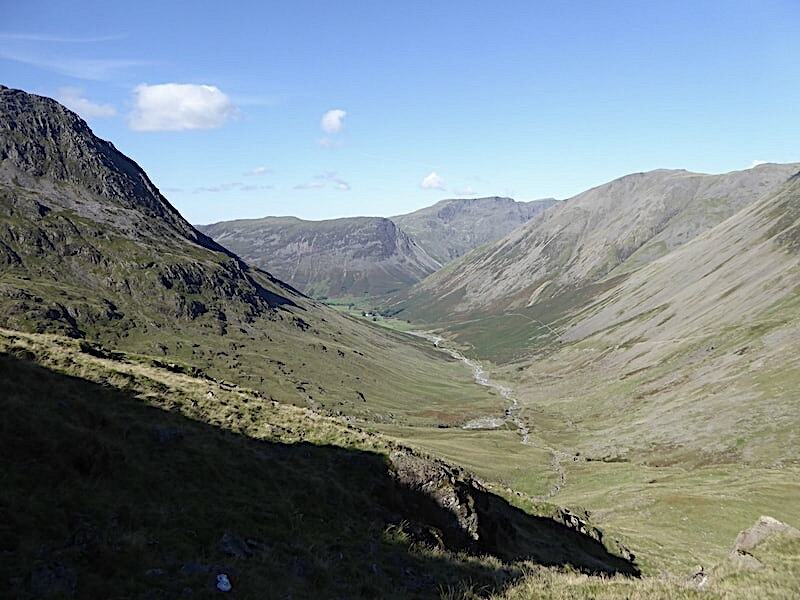 That much we could work out, but where he or she went remained a mystery as we saw no sight of it in the skies above Wasdale. It was a very strange, and slightly disturbing, sight to witness. 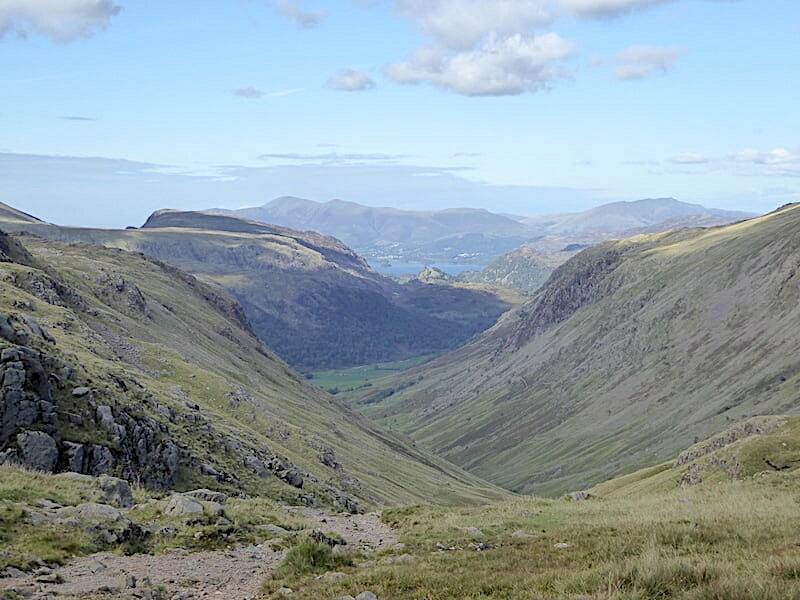 We carried on along the path, still discussing the ins and outs of what we had just experienced, and made our way over to Skew Gill taking in this view of Lingmell and Wasdale along the way. 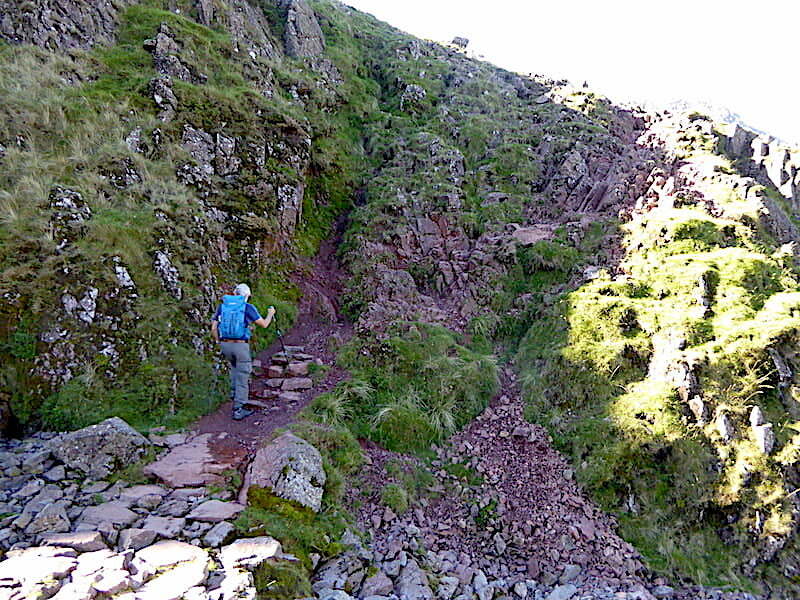 Crossing Skew Gill, the climb out requires a mild scramble but there are no hidden terrors. 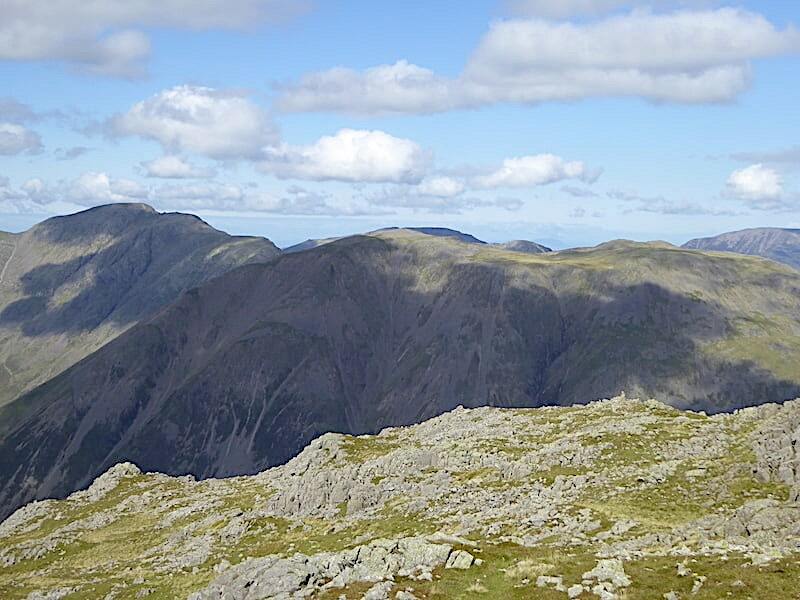 A look over to Great Gable, Green Gable and Base Brown from a sunnier section of the path. The shadier parts of it were very welcome too as they gave us some periods of respite from the very bright sunlight and the chance to cool off a little. 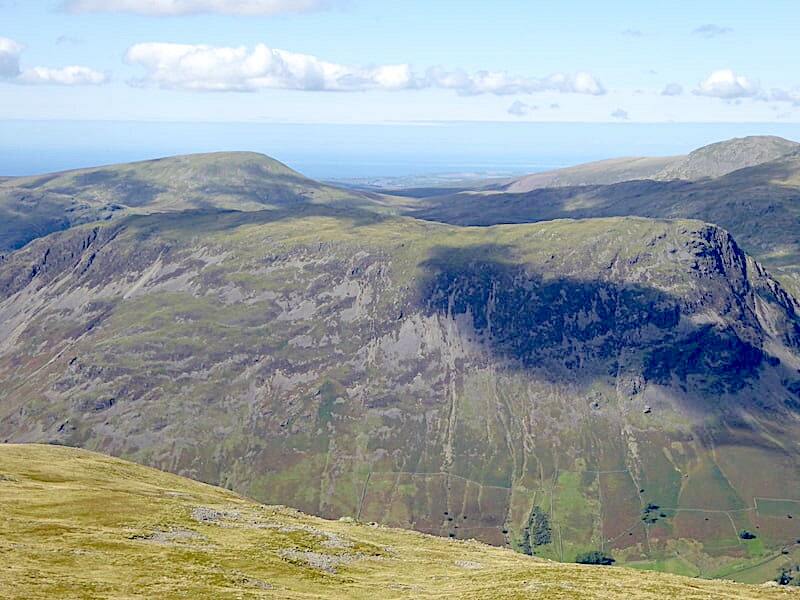 Before we plunged into another spell of shade I took one more look along Wasdale to a couple of those long neglected fells which we finally visited once again this summer, on the centre skyline is Red Pike and below that to its left is Yewbarrow. 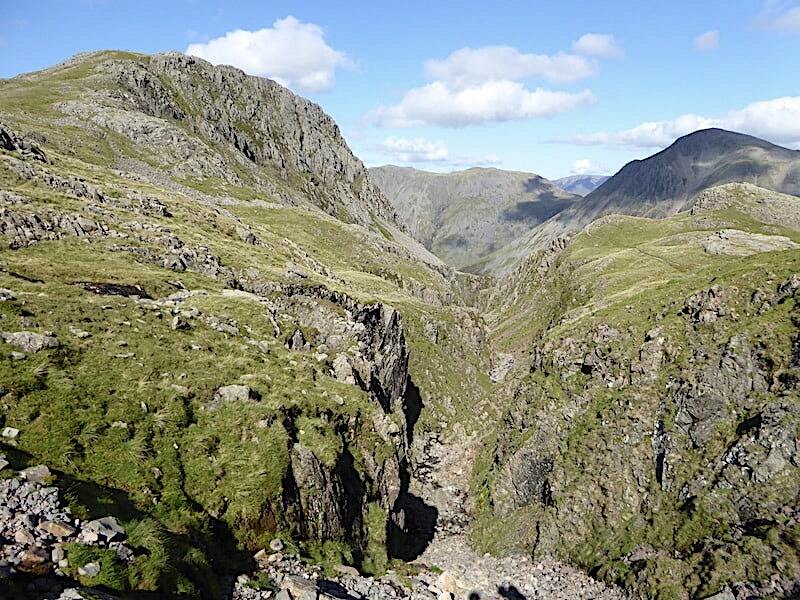 We’re progressing along very nicely as the path rises steadily and on our right we have this splendid view of Lingmell, its jagged cliffs and deep chasm of Piers Gill. Even at this distance its still an awesome sight. 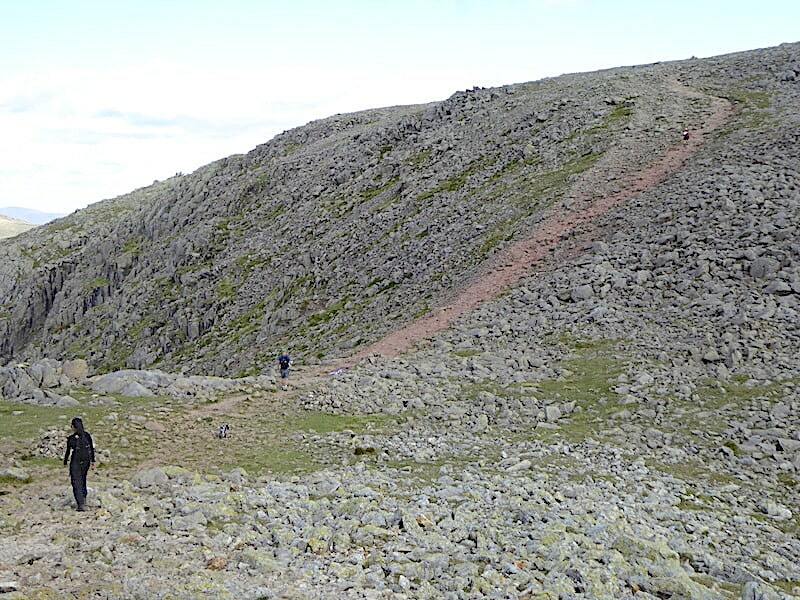 Lingmell still making its presence felt as we begin to climb a little more steeply to reach the top of the rise …..
….. and then, as we do so, we immediately have to drop down again over this ‘bad step’ which is the only awkward bit along the route. Just as I was taking this shot looking back up from the path two young women appeared at the top, if you zoom in one of them can be seen at the top preparing for the descent. It looks worse than it really is and its definitely not a problem with my five points of contact method. 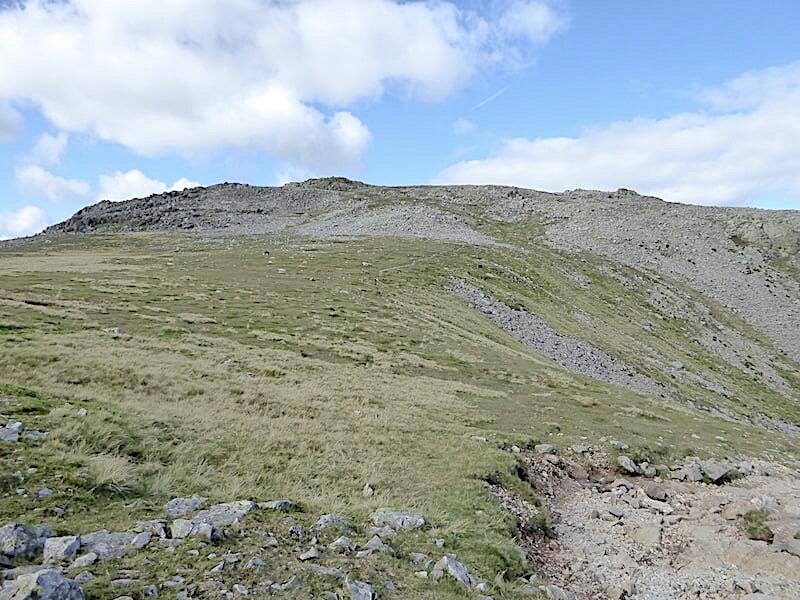 No sooner had they descended and walked past us than a solo male walker appeared at the top. He too made his way down carefully, stopping to have a quick word with us before continuing on his way. I waited until everyone had passed by us and then hunted around for a suitable place to take a shot looking down Greta Gill which passes immediately below the ‘bad step’ down the rocky area on the lower right of the shot. With the sun right behind me, everywhere I stood for a decent look down the gill had my shadow showing up in the shot, so this was the best I could come up with. A little further round the path and another look back at the ‘bad step’ section and the fairly level path coming along from it. We’re well along the path now so another look back at the more or less level route back to the ‘bad step’. A little cloud is beginning to build but its only what the weather folks call ‘fair weather cloud’ and what I call ‘cotton wool cloud’. J striding out along the stony/gravelly path as we pass by Criscliffe Knotts and, so far, his ankle/foot seems to be OK with what we’re walking over, fingers crossed that’s how it stays for the whole of the walk because there’s a lot of rough ground to come. Our faces though are beaded with sweat once again now that all semblance of shade has vanished, the gradient might not be in your face but its very warm work nevertheless. We couldn’t look to our left (right as you look at the shot) because the sun was so blindingly bright. 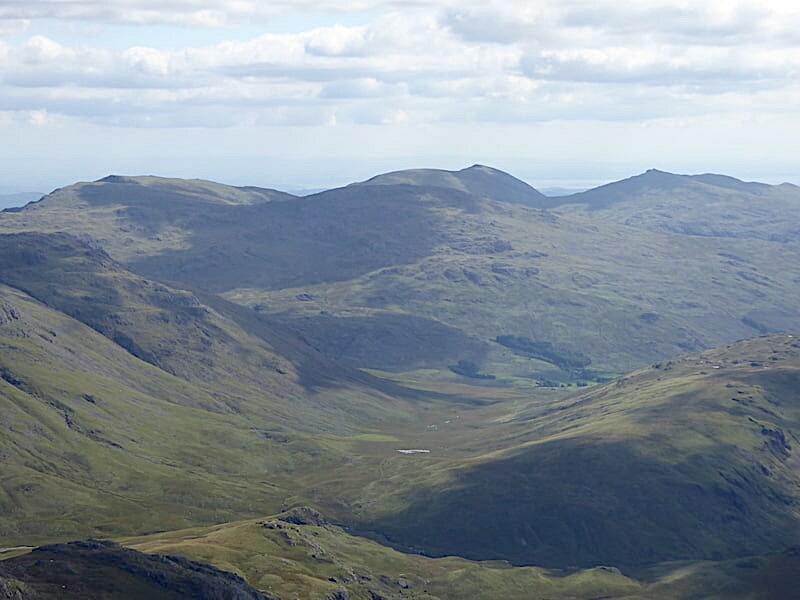 We are gradually gaining height and so Skiddaw and Blencathra are beginning to appear on the right skyline. 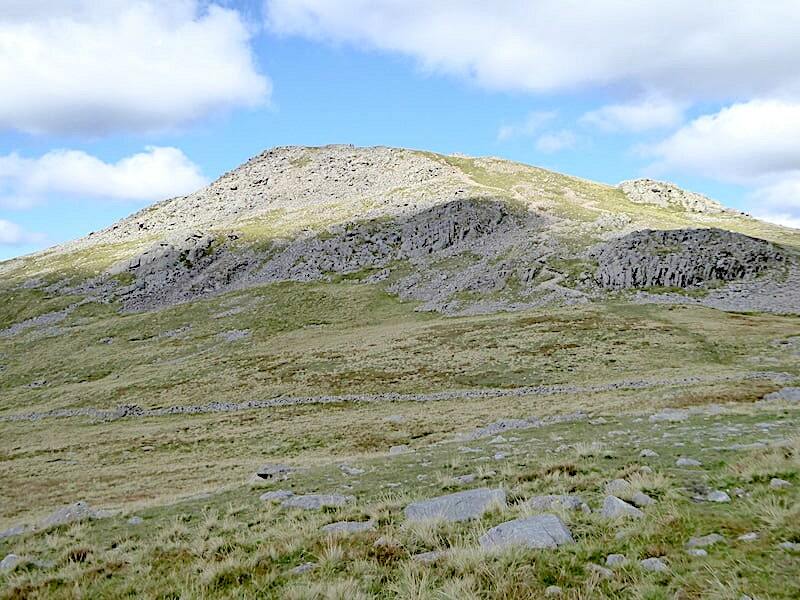 After a steepish climb we reach another more level section where we stop for a brow mop and I take a look back at Round How which we have just walked below. 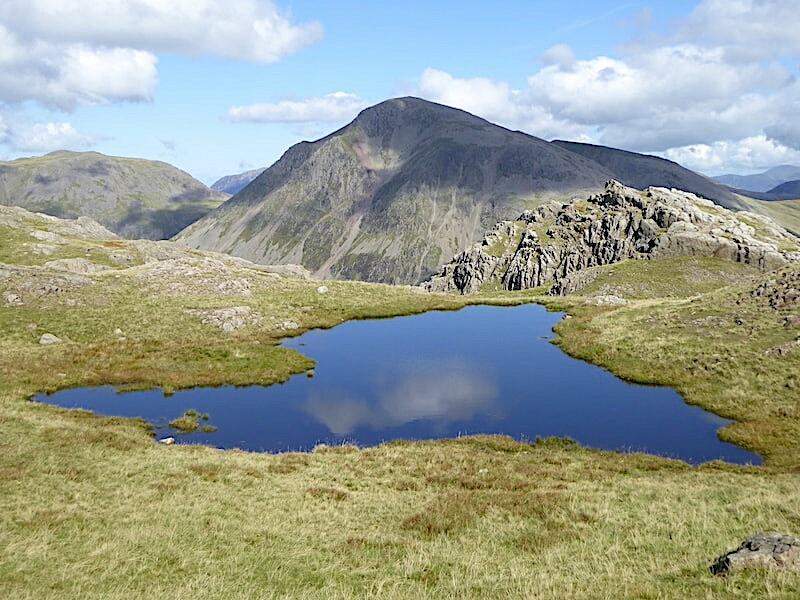 Alongside the path by Middleboot Knotts is this attractive but un-named tarn, beyond which tower the steep scree sides of Great Gable. I can’t stop myself getting the camera out and rattling off a few shots. 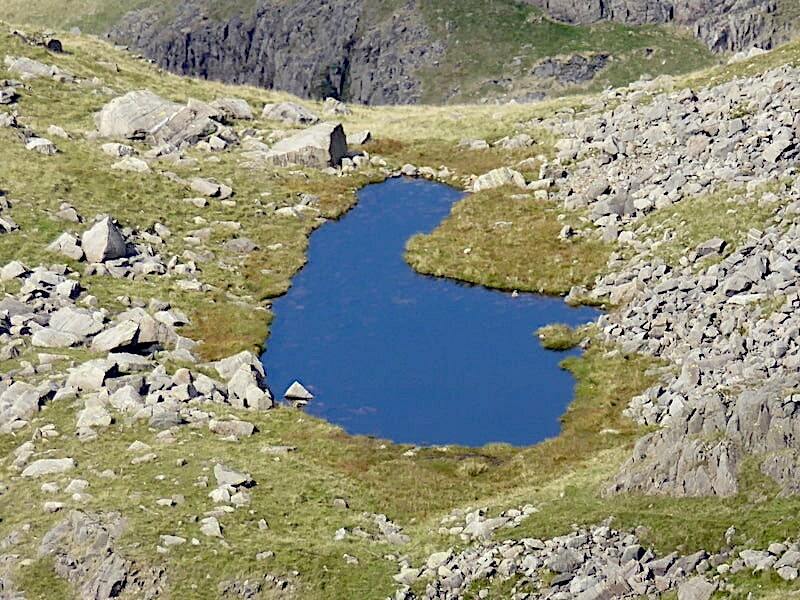 A cloud reflected in a still blue pool, a jagged outcrop just beyond it, the green of the grass, the pink of the scree slopes, the clouds casting a mysterious shadowy cloak across Gable’s summit as they drift across the blue sky, the soft gentleness of the tarn juxtaposed with the steep stark slopes beyond, all combining to create a lovely image which will live long in the memory. 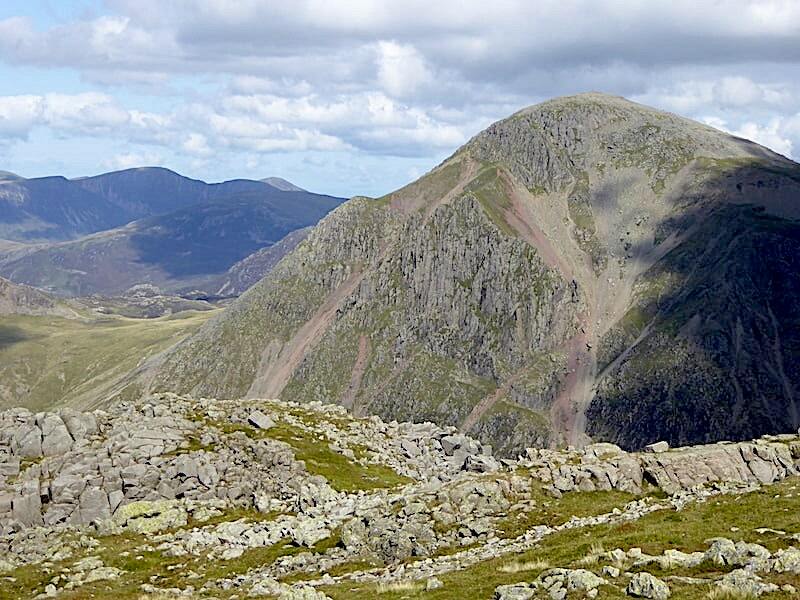 We tear ourselves away and carry on past Middleboot Knotts with the Lingmell col getting ever closer …..
….. while Round How recedes and is dwarfed by the enormous bulk of Great End. I couldn’t resist another shot of the un-named tarn with Skiddaw, Blencathra and Clough Head now on the distant skyline. 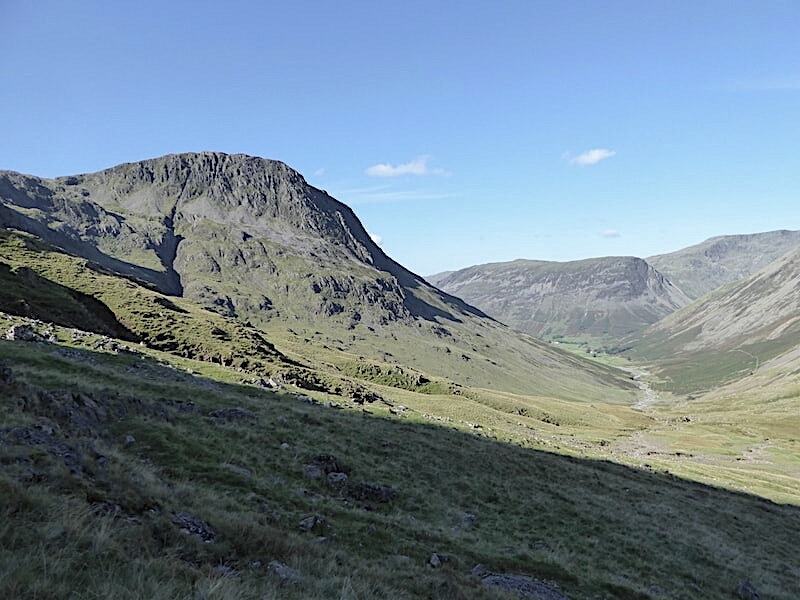 We stop and consider our route across to the Lingmell col and plan to leave the Corridor Route when we reach the broken wall on the left of the shot. 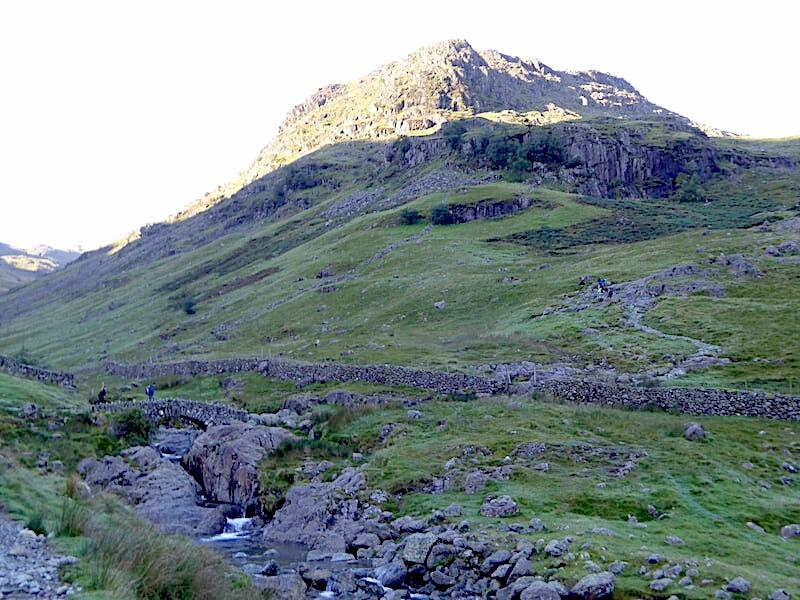 We’ll climb beside the wall up to the col and then take the path up to Lingmell from there. 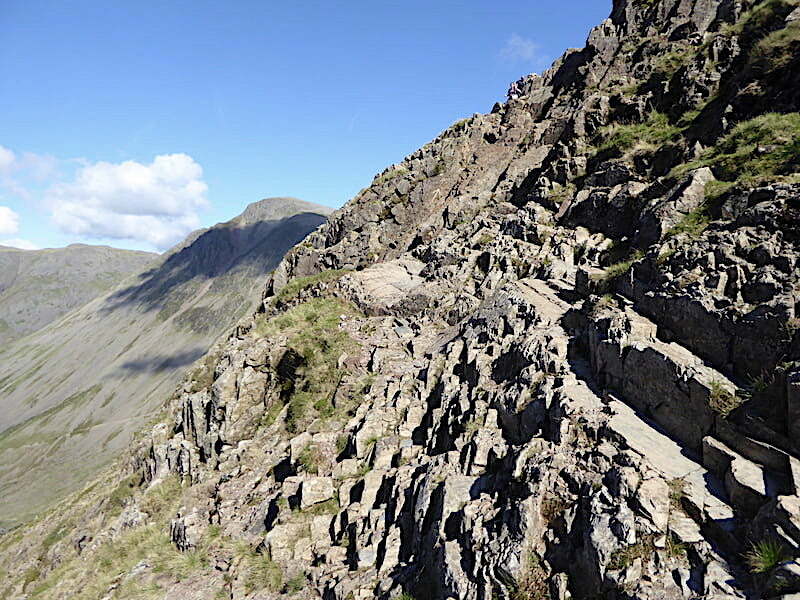 That’s still some way off though and before then …..
….. we have to cross Piers Gill, quite straightforward as the path across is not in the least bit difficult to deal with …..
….. and offered the perfect opportunity for a shot looking along it. There’s no water flowing over the path but there is just a trickle of water in the gill down there so it seems to be seeping out a little way below us. I thought it best not to go and investigate further. 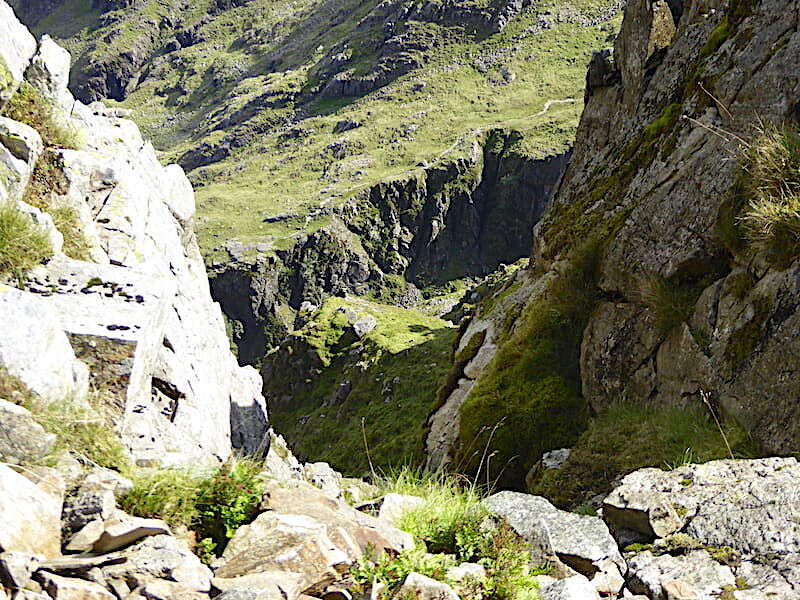 From the crossing of Piers Gill there is one last haul up alongside the broken wall and we reach the col at last, where we stand in the shade for a moment or two to cool down and give ourselves a bit of breather before we head up to the summit of Lingmell. 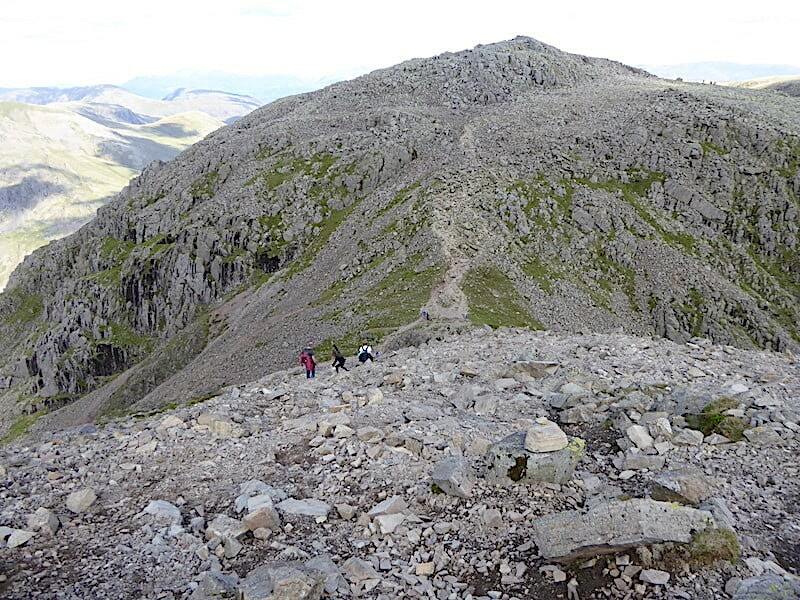 A couple of walkers appear at the top and begin their descent as we prepare to move off. We had quick discussion about a food stop as its just a minute or so past noon, eventually deciding to take the break when we reach the top. Aside from the drifting clouds, Lingmell will remain in full sun, there will be some comfortable grassy places to sit and most of all it won’t be swarming with dozens of other walkers so there will be the chance of a little peace and quiet before we get to the inevitable hullabaloo on Scafell Pike. Food stop decision made we haul ourselves up the short distance to Lingmell summit, find a sunny grassy spot complete with rock slab backrests and a view of Scafell Pike across the col and settle down for our rest and recuperation stop and watch the Scafell Pikers toiling up the steep slope to the summit. We’ll be joining that throng before too long but the legs will have been refreshed and refuelled in readiness for the slog by then. After lunch I had a wander around for a few shots of the surrounding views, here I’m looking straight down the south west slope of Lingmell at Wast Water with Illgill Head to the left of it and Middle Fell to its right …..
….. the Mosedale Horseshoe over to the north west …..
….. Styhead Tarn to the north east with Blencathra and Clough Head on the distant skyline …..
….. clouds stubbornly hanging over Pillar and Kirk Fell …..
….. the near vertical cliffs of Great Gable’s southern face …..
….. a diminutive Yewbarrow across the middle foreground backed by Seatallan on the left with Caw Fell and Haycock over on the right …..
….. peering down one of Lingmell’s many gullies into Piers Gill …..
….. the view of Great End, Ill Crag, Broad Crag and the Broad Crag col from our lunch spot …..
….. north eastwards to Blencathra and the Dodds on the right skyline …..
….. and the Helvellyn range now just peeping up above Glaramara to the left of Great End. 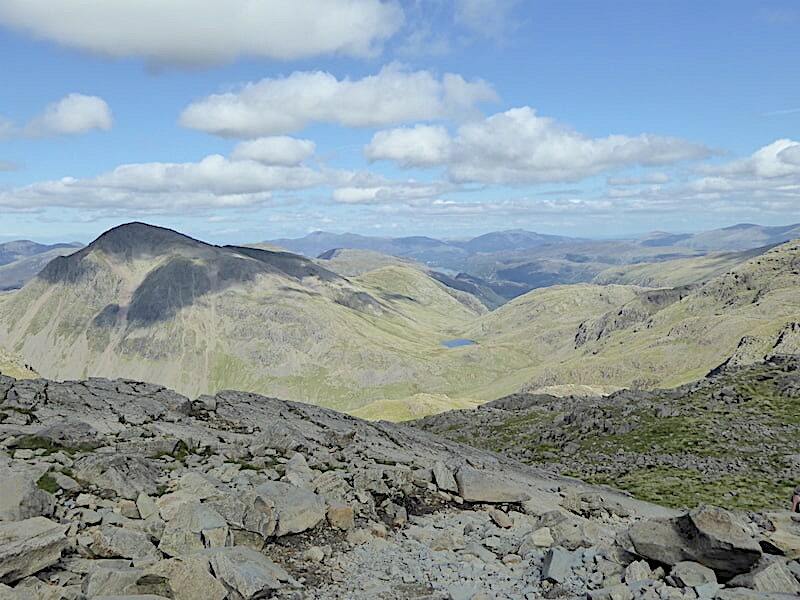 We spent a very pleasant half hour eating our lunch, viewing the scenery and watching an endless trail of walkers slogging up the path to Scafell Pike before packing our gear and heading across to join the throng. 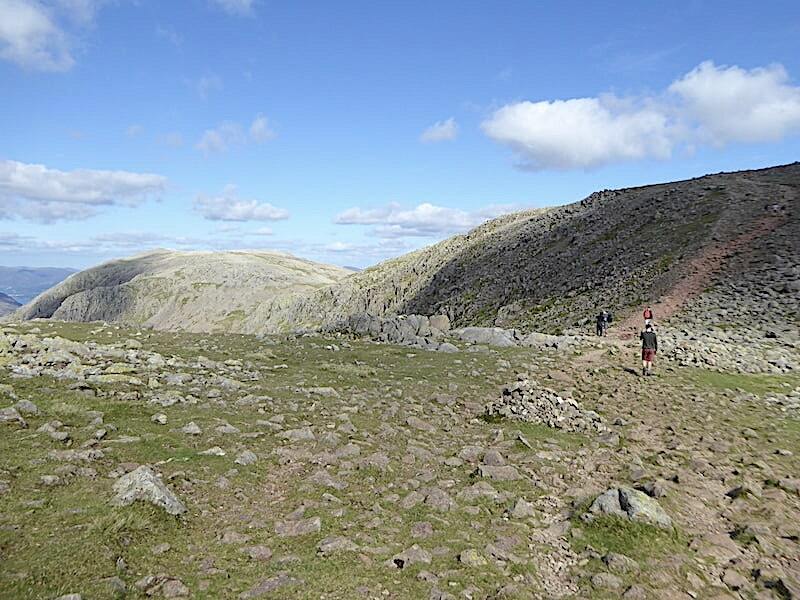 The two walkers below have just descended Scafell Pike and are now making the steady climb up towards us. As we reached the col two more appeared and slowly followed them up. By the time we reached the col the first two walkers were silhouetted against the sky at the summit with the following two still some distance below them. It might need a zoom in to spot them though. 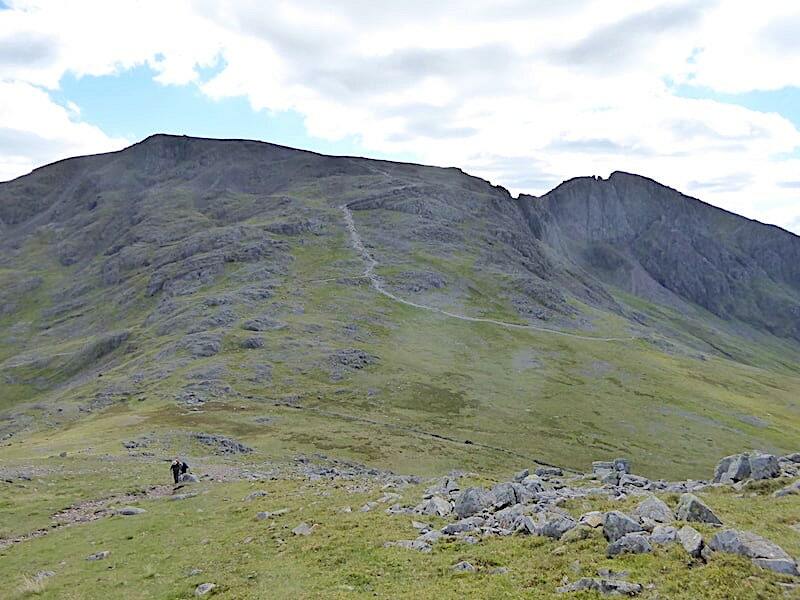 So, here we are, beginning the long haul up the abominably loose and slithery path to the summit of Scafell Pike with a look back to Lingmell across the col. A pair of walkers just descending to the path junction, a solo lady walker to the bottom right who had just arrived via the Wasdale/Brown Tongue path and dozens more coming up the same way behind her. She maintained roughly the same distance behind us all the way to the top where we lost sight of her in the general melee. 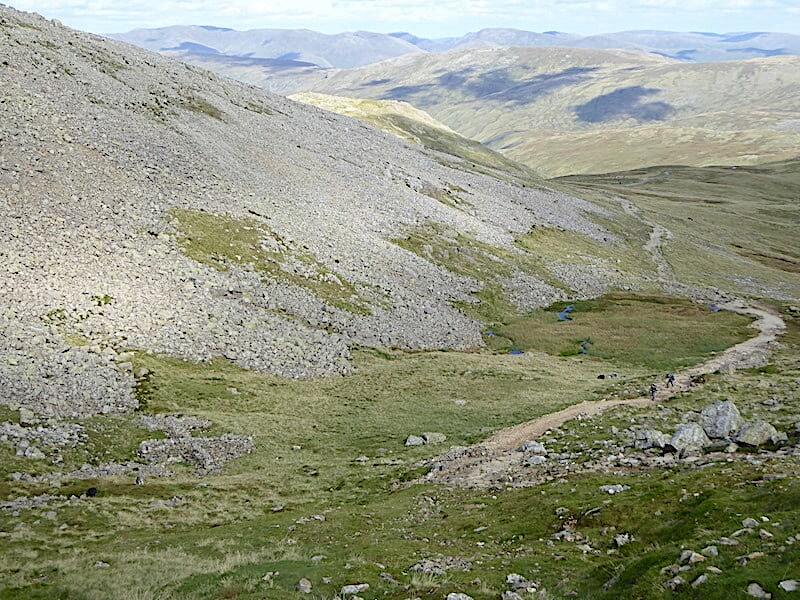 The path was extremely busy with walkers ascending and descending all along its length and we said hi/hello to so many people and so often I thought of how the Queen must feel when she has to meet and greet endless lines of folk. Extensive views all around as we climb, stopping every now and then to let descending walkers come by, or to give the legs a brief rest from all the slipping and sliding they were having to deal with. Just as I had taken this shot and was putting the camera back in its case I heard a brief yell above me. 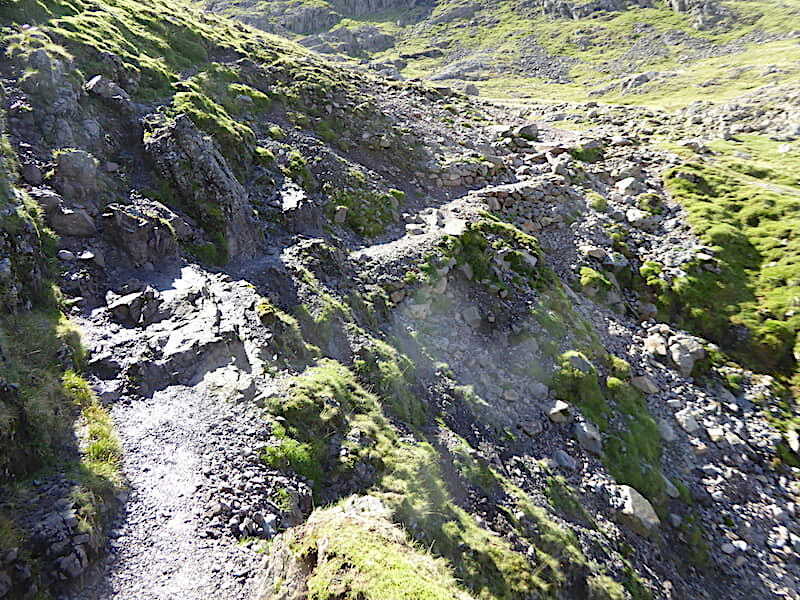 I turned around and looked up to see a tall, well built man take a bad tumble, just a couple of yards ahead of me, as the loose stones slid away beneath his feet causing him to fall heavily to the side of the path. He landed face down with his rucksack flying off his back, arching clean over his head and coming to rest on the ground above his head, the shoulder straps still hooked around his shoulders. He was on his feet again by the time we got up to him but we asked him if he was injured or had banged his head and he assured us that he was OK and still in one piece as he mopped himself down and dusted himself off. 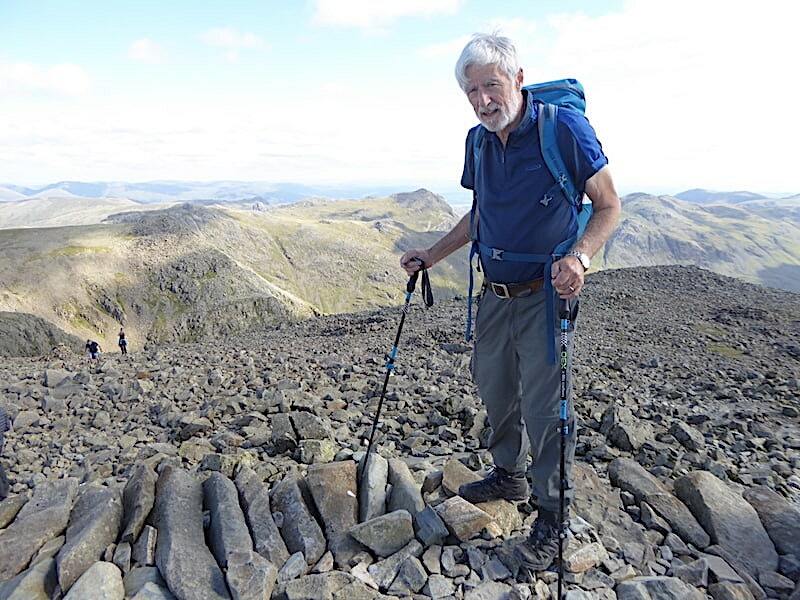 He must have been badly shaken still but he gathered his gear together, grabbed the leads of his two dogs and once again began the uphill trudge to the summit. The solo lady walker in pink is taking things as steadily as we are, is still maintaining the same distance behind us and stopping for a rest every time we do. 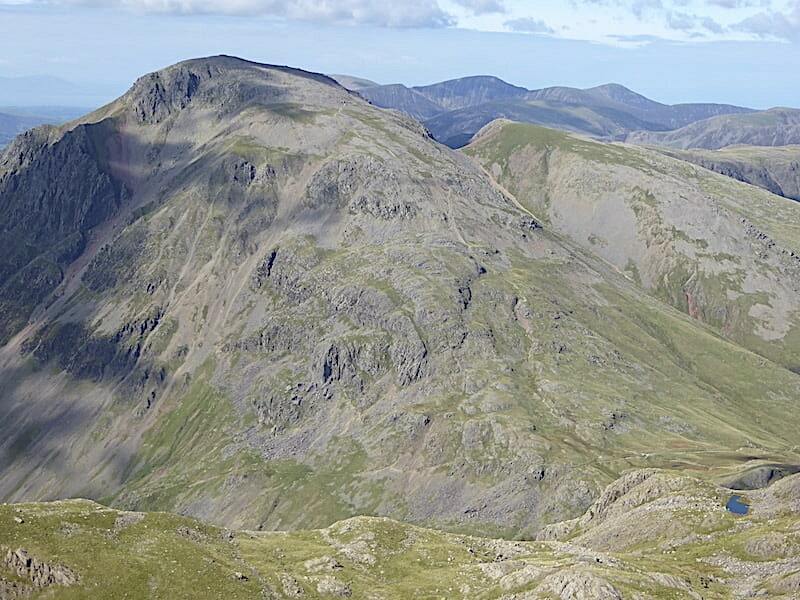 Below us is Lingmell with Great Gable to its right. Behind it Kirk Fell is still under a cloud, which it seemed to be every time I took a look back. 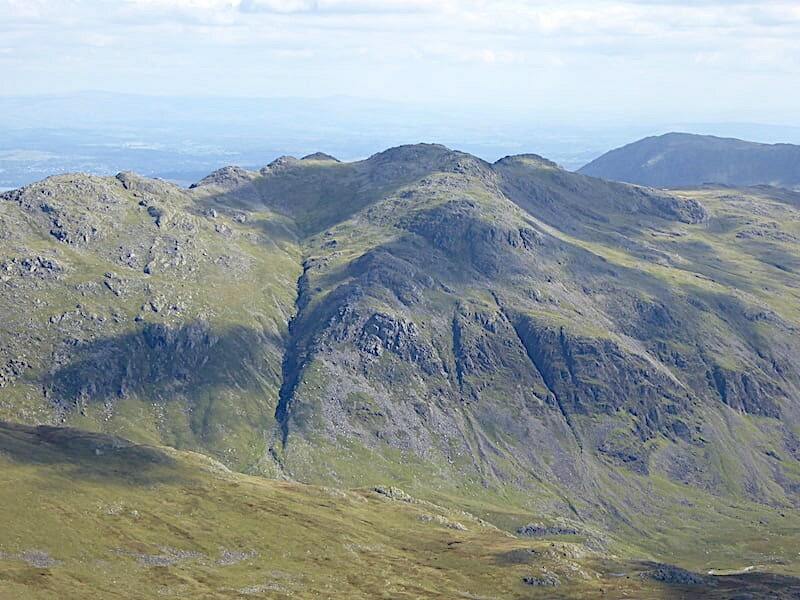 Behind it to the left though, Pillar and the High Stile ridge are sunlit and clear to see as are the Grasmoor fells on the centre skyline. 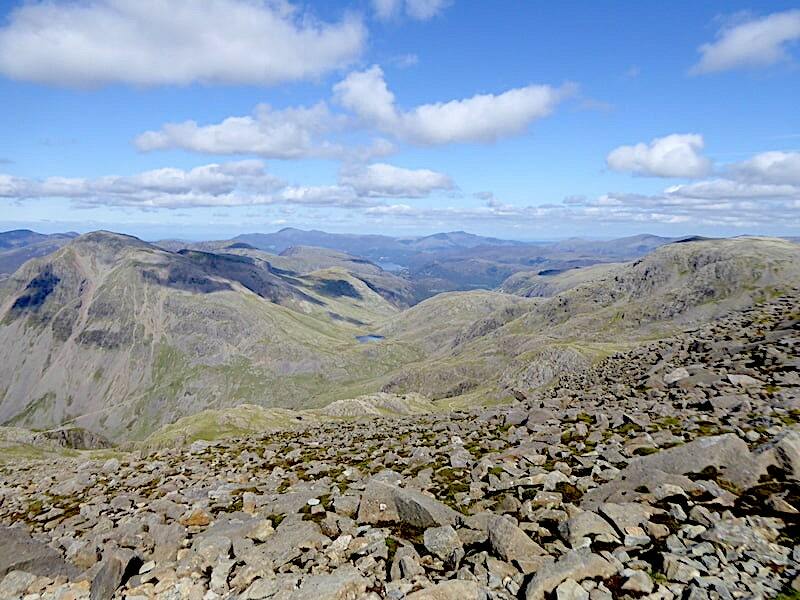 Our eyes are constantly drawn to the views all around, what is it about them that is so fascinating? After all, the mountains themselves never change, but the light and shade falling on them alter everything about them and the same view then looks quite different to the one you saw just a few minutes before. Magical and mesmerising. 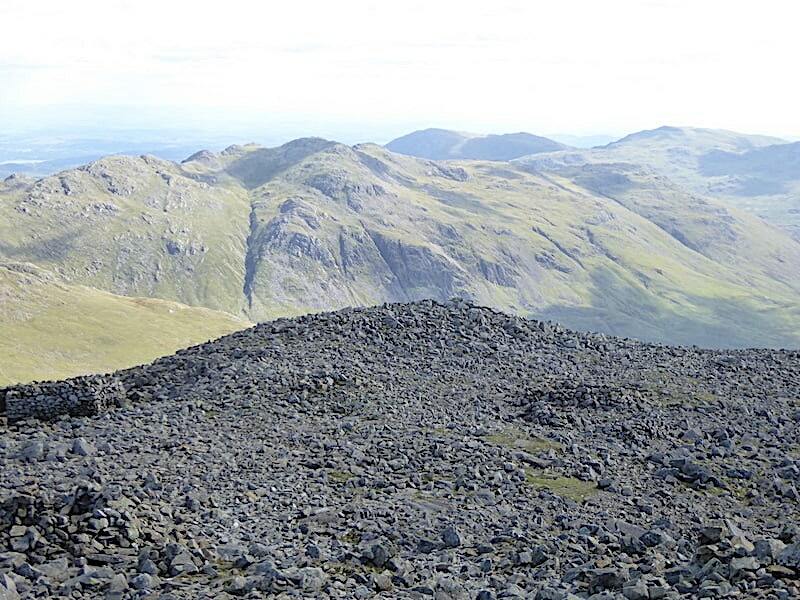 Looking ahead to the summit platform and the torture of the bouldery crossing is all that remains between us and it. I check with J how his ankle/foot are doing since it can play up over very uneven ground and it would be difficult to find anything any more uneven than this. Surprisingly he reports that all is OK and he’s experiencing no problems with it. 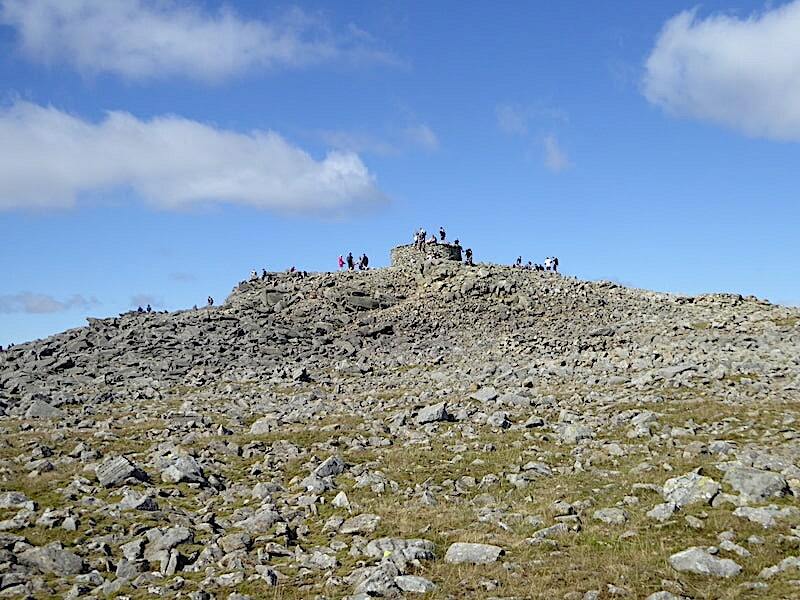 We gingerly make our way across the last few yards and climb up onto the summit platform which was restored back in May by a group of rangers from the National Trust. 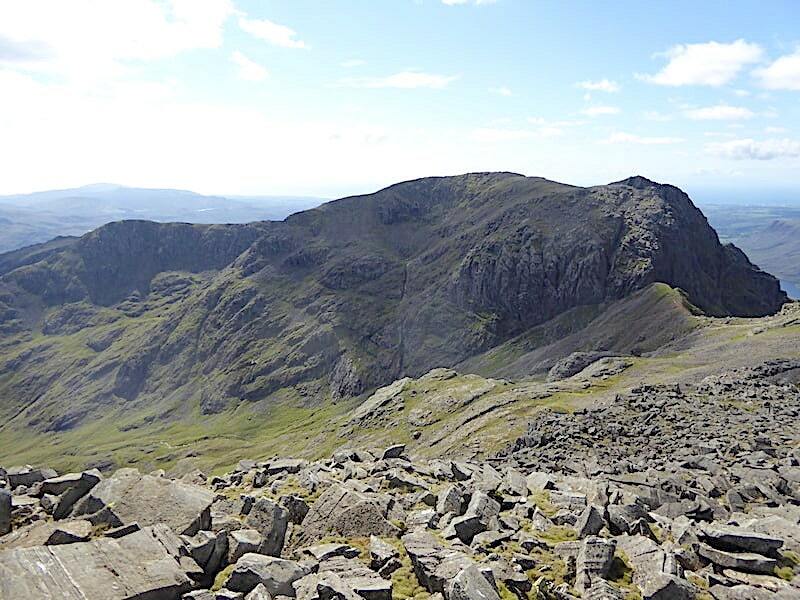 Scafell Pike was gifted to the National Trust by Lord Leconfield in 1919. In memory of the men of the Lake District who died during WWI a memorial plaque to that effect is set into the wall of the platform although with so many people around it was impossible to get anywhere near it. Amongst the crowd was the group of Chinese walkers and their guide taking a lunch break. 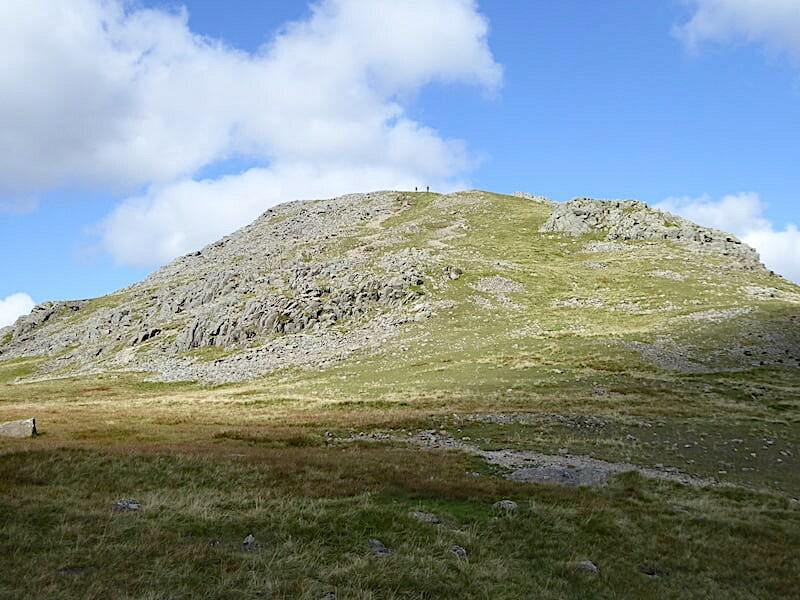 The young guy who had struggled with his boots at Greenhow Knott recognised J and gave him a big smile and a cheery wave and it was good to know that they had eventually managed to make it. From the platform here’s a look north eastwards across Broad Crag, Ill Crag and Great End towards the Dodd and the Helvellyn group on the skyline. 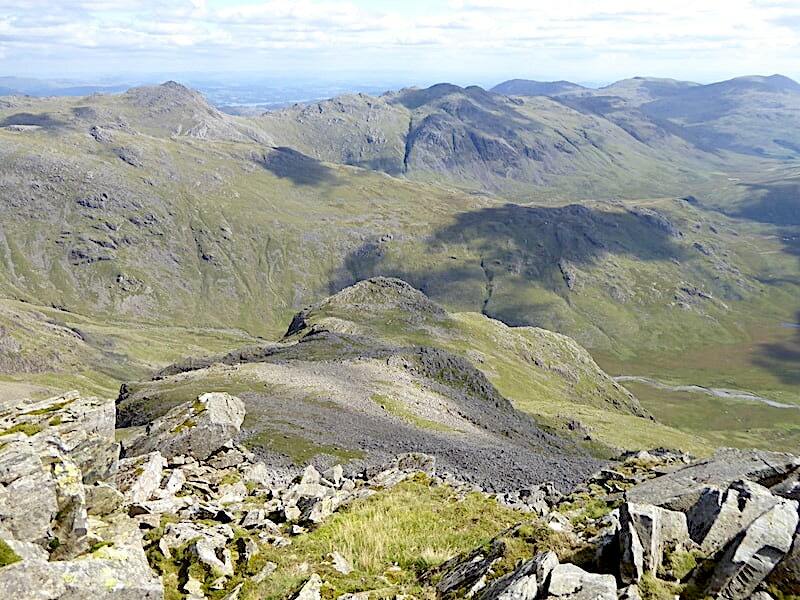 To the south east below us are Ill Crag on the near left, Esk Pike just behind it with the pointed top of Bowfell over on the right. 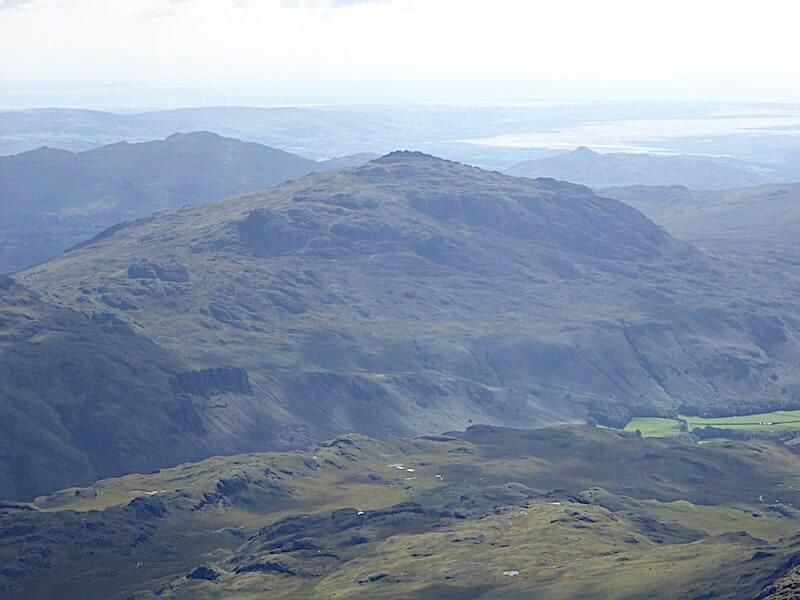 A small slice of Windermere visible behind Bowfell. 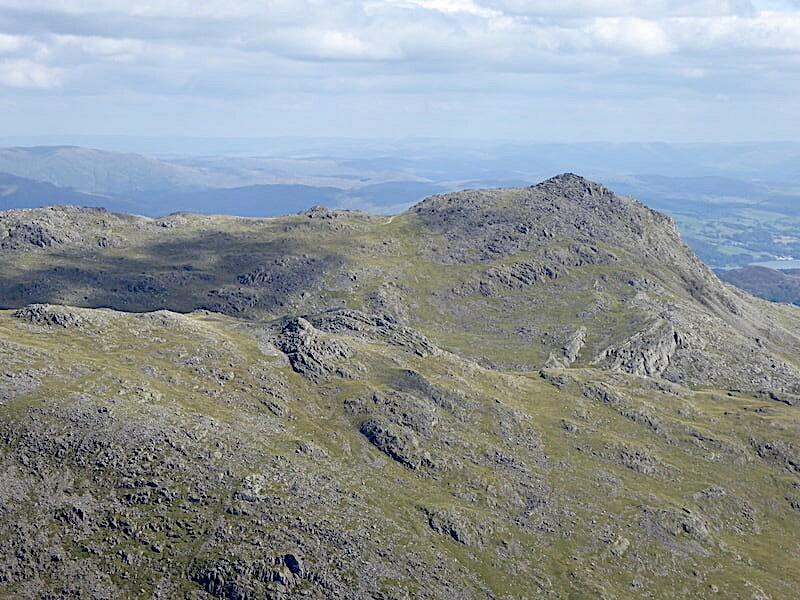 To the south are Crinkle Crags behind which is the Wetherlam/Black Sails ridge. A large group of noisy young men arrived behind me as I took this shot with J beginning to look a little annoyed, he was even more irritated when one of them shouted “Open the champagne”. My thoughts were ‘How about opening your eyes first and taking in what’s around you? 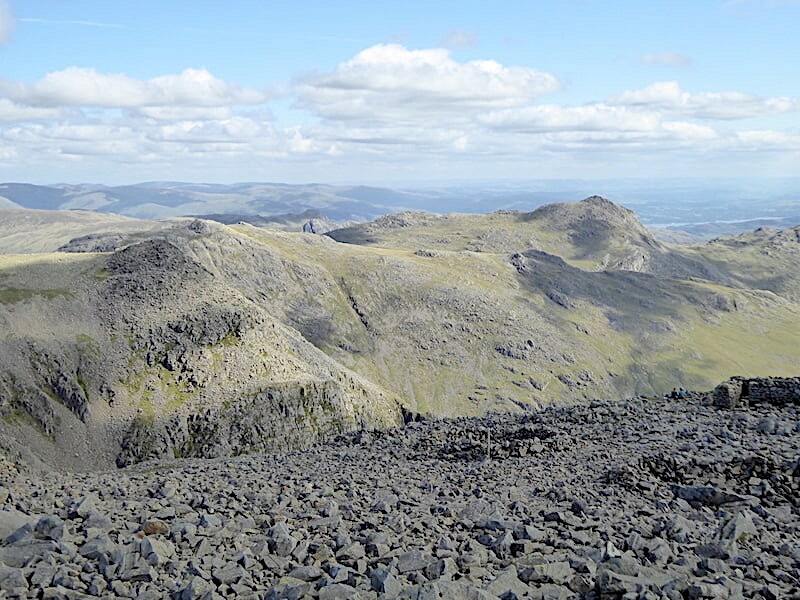 You’ve just toiled your way up to the highest peak in England so get your heads out of the rucksacks and drink in the rugged majesty and beauty of your surroundings before getting the champagne down you.” Maybe we’re just old-fashioned but neither of us could put up with it all any longer so down we went. 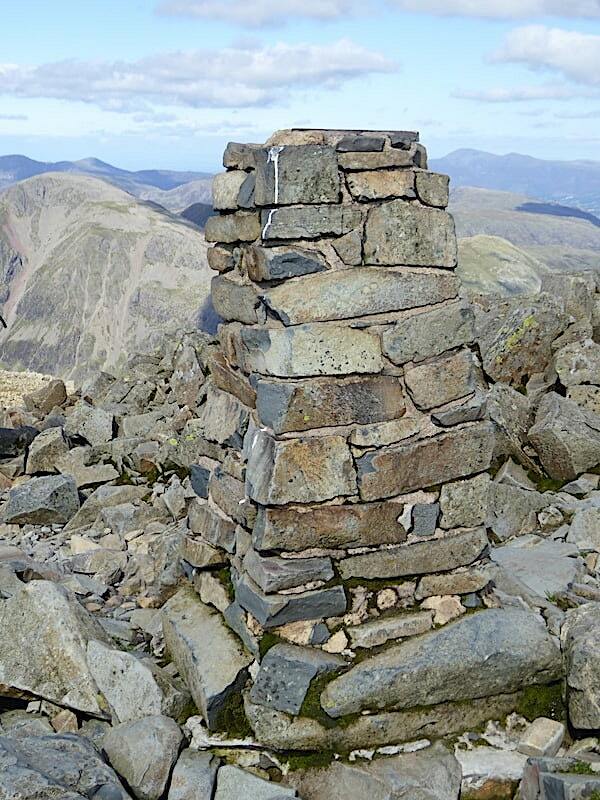 A man leaning across the trig column and gazing down to Wast Water finally moved away from it after being nudged by his wife when she saw me waiting patiently so here I am, hair flattened and damp with sweat and still looking harassed. I couldn’t be bothered with the faff of unzipping the trouser bottoms during the morning so they were rolled up instead. I was surprised to see so many folk wearing jumpers because it certainly wasn’t at all cold and there wasn’t a hint of a breeze. Believe me, if I’m down to t-shirt level its very warm indeed. The trig column in close up, the only way I could get a shot without a bit of somebody’s arm, leg, head or rucksack being included in it. 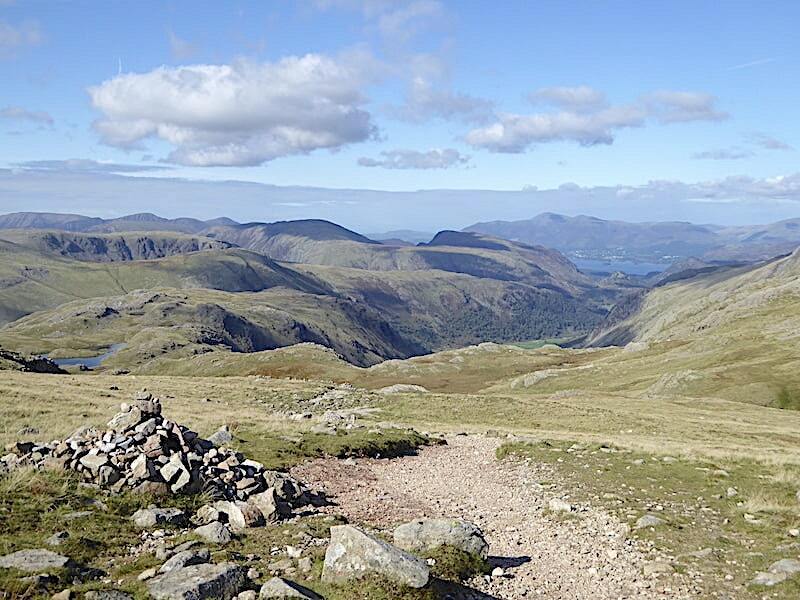 We beat a hasty retreat, noticing as we did so that the Chinese walkers were taking their leave of the summit and making their way over to the descent path. We made the short walk over to the south top for some different views and some much needed peace and quiet. Once away from the hustle and bustle I took this look back at the busy summit platform. 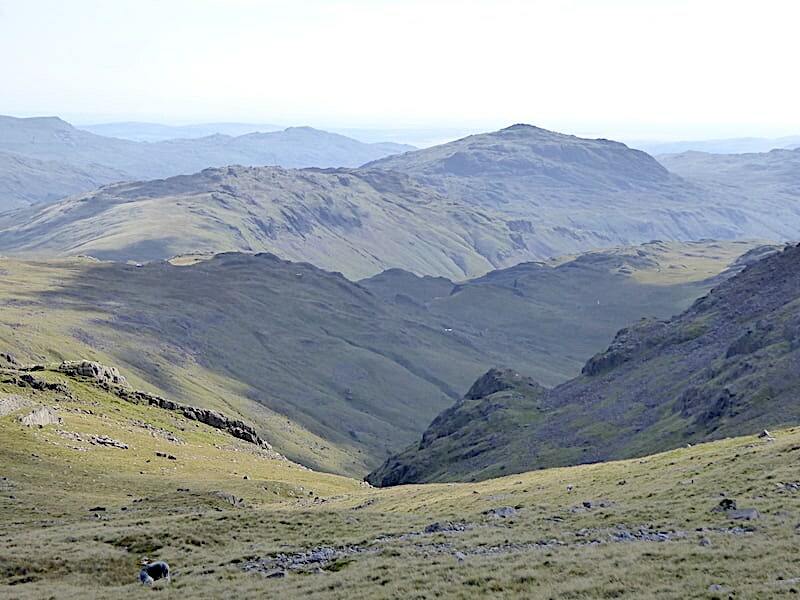 A magnificent view into Eskdale from the south top where there wasn’t anyone else around, two walkers having just left as we approached. The solitude and peacefulness was very welcome after the hurly burly of the main summit area, and although it was wonderful to have a bit of silence I did wonder why most folks don’t bother to walk the short distance over here, just look at what they’ve missed. 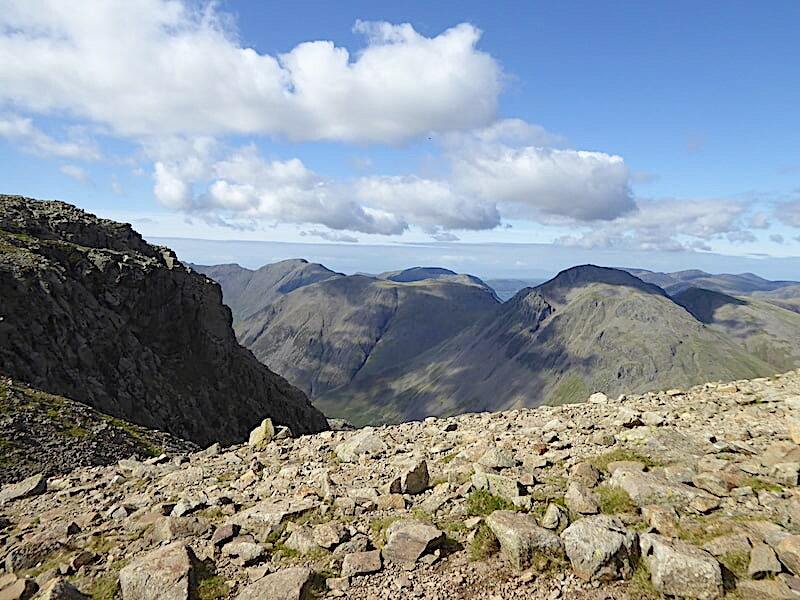 I wondered if climbing Scafell Pike has come to be regarded simply as an ‘experience’ or a ‘bucket list’ item nowadays, and nothing else being worth bothering with? 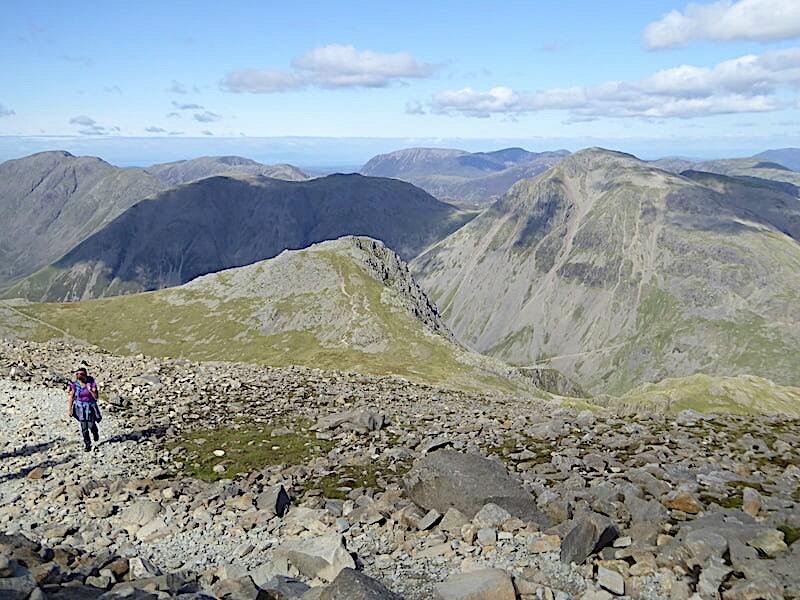 I banish depressing thoughts and take a look down to Pen, one of Scafell Pike’s subsidiary summits …..
….. and then across to the Mickledore col behind which stands Scafell, Scafell Pike’s very slightly lower companion, dropping down to Slight Side over on the left …..
….. to my left is Ill Crag with Esk Pike to its right and several layers of fells to the east of them …..
….. and behind the slopes of Esk Pike’s south ridge Bowfell rears up, looking a lot less mighty from here than it does from many other viewpoints …..
….. with the intricate characteristics of Crinkle Crags on display just below Bowfell …..
….. a zoom in for the skyline view of, from left to right, Great Carrs and Swirl How, Brim Fell and Coniston Old Man, and Dow Crag, Buck Pike and Brown Pike …..
….. another zoom along Eskdale for a closer look at Hard Knott …..
….. across Hardknott Pass is Harter Fell with the Duddon Estuary just beyond it. 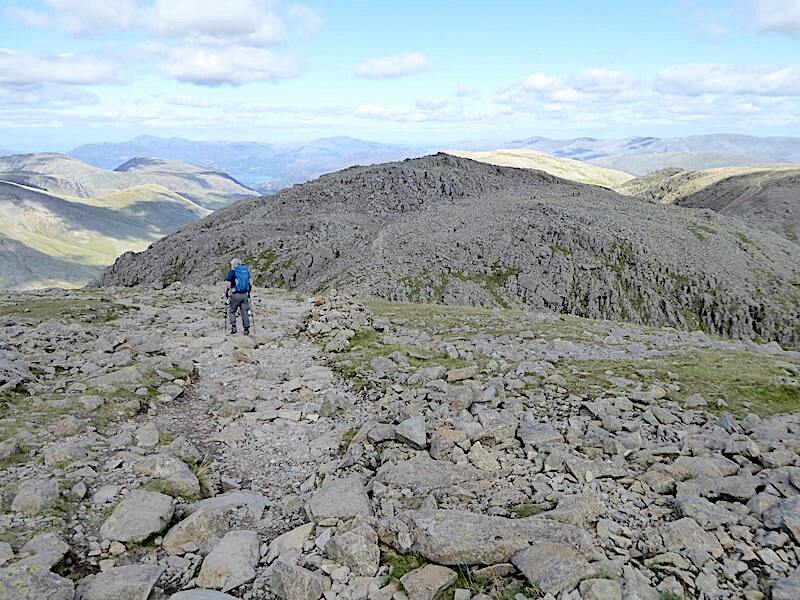 We leave the peace and quiet of the south top somewhat reluctantly and head back up towards the main summit area although we didn’t go all the way back to it. Instead we cut across just below it to pick up the path down to the Broad Crag col. Broad Crag itself is on the left of the shot, its top showing just above the grassy patch on the extreme left. 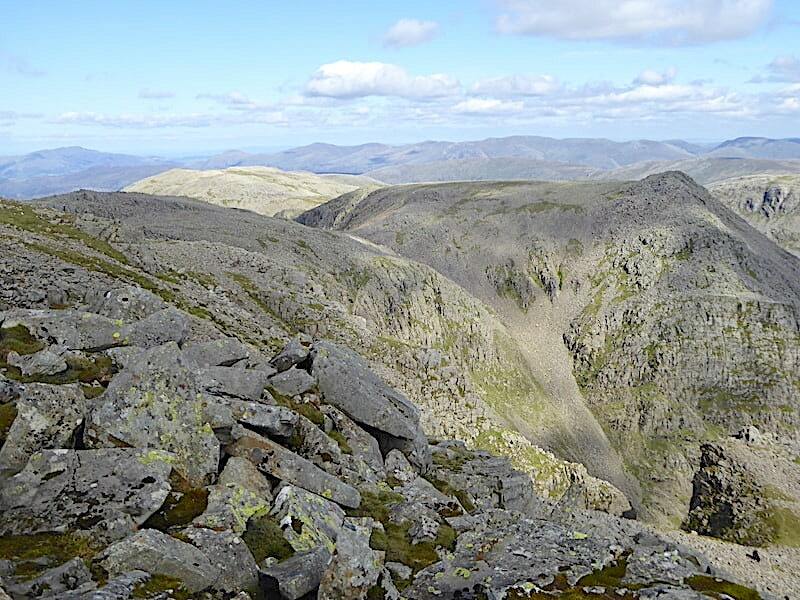 From there we’ll drop down and continue on the path across Ill Crag whose steep scree sides and pointed rocky top can be seen over on the right. Right then, its time to hang on to our hats, so to speak, and pick our way carefully down to the col. There’s no other way to do it since whichever piece of rock you choose to put a foot on its likely to tilt, wobble or roll and throw you off balance. I remind J of his fall while descending Slight Side some years ago and urge him to watch what he’s doing. He tells me not to worry, he hasn’t forgotten it and right now its uppermost in his mind. With that assurance I can now concentrate on where I’m putting my feet. The view down to the col. A zoom in will reveal the young lass in the middle of the group of three fighting to keep her balance just as I took the shot although I didn’t notice her at the time. On the col itself are two tiny figures, they are the group guide and one of the Chinese girls waiting for the other two members of the group to catch up with them. They are presently hidden from our view below the slope. 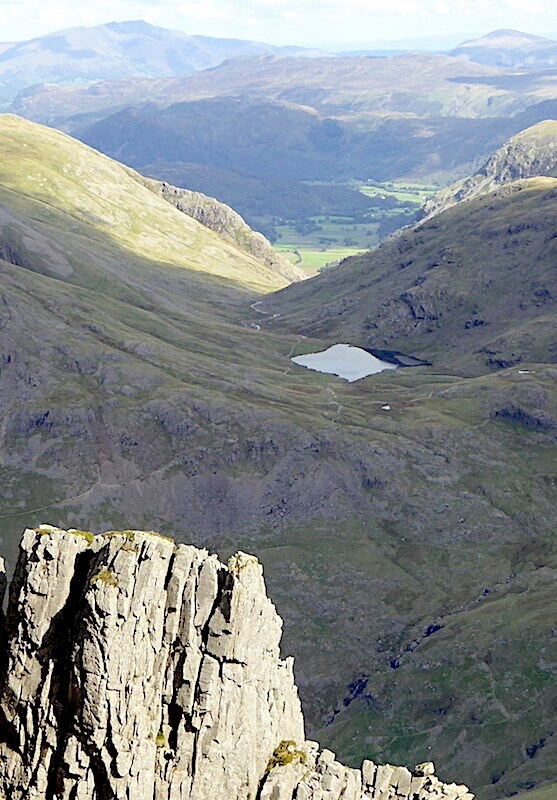 Behind them the path rises and crosses Broad Crag, bypassing the summit. 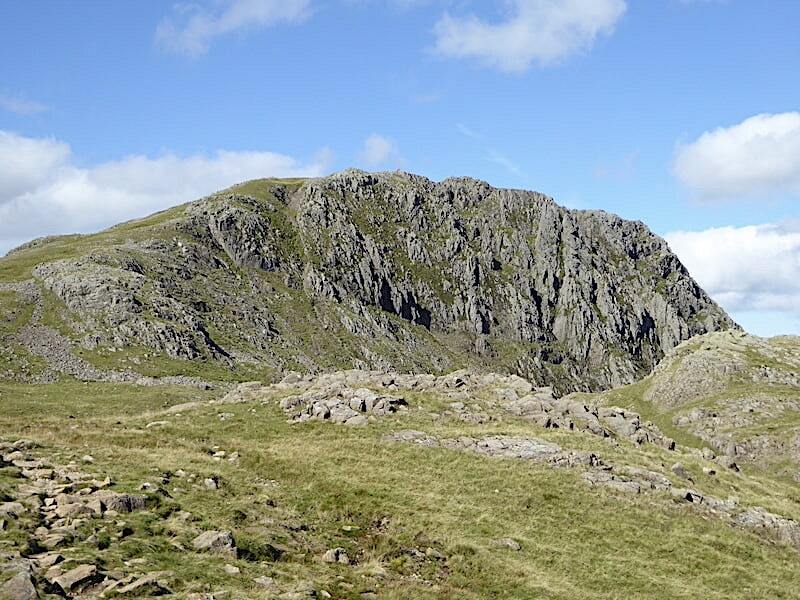 We had no plans to climb up to the summit of Broad Crag, this is torture enough at the moment. 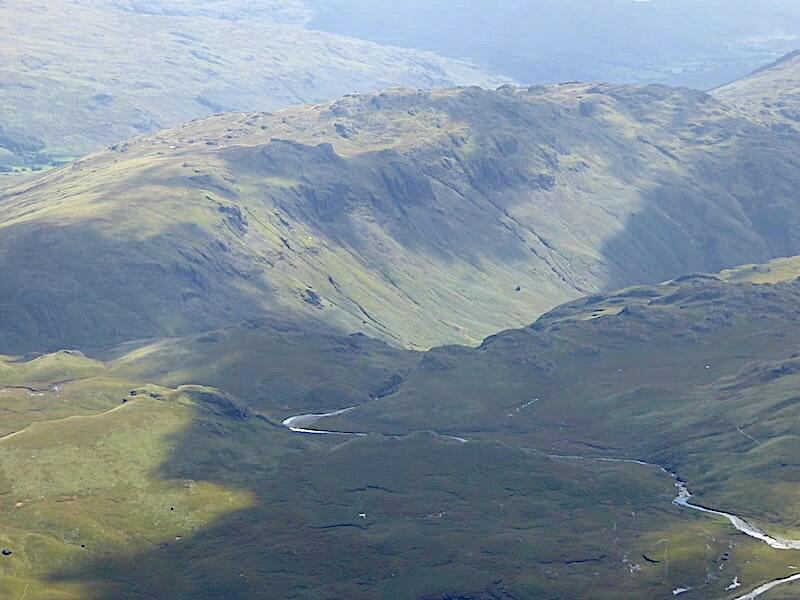 Kirk Fell still in the shade of a cloud and far below us is the Corridor Route we followed this morning, part of which can be seen below Lingmell as it crosses the head of Piers Gill. 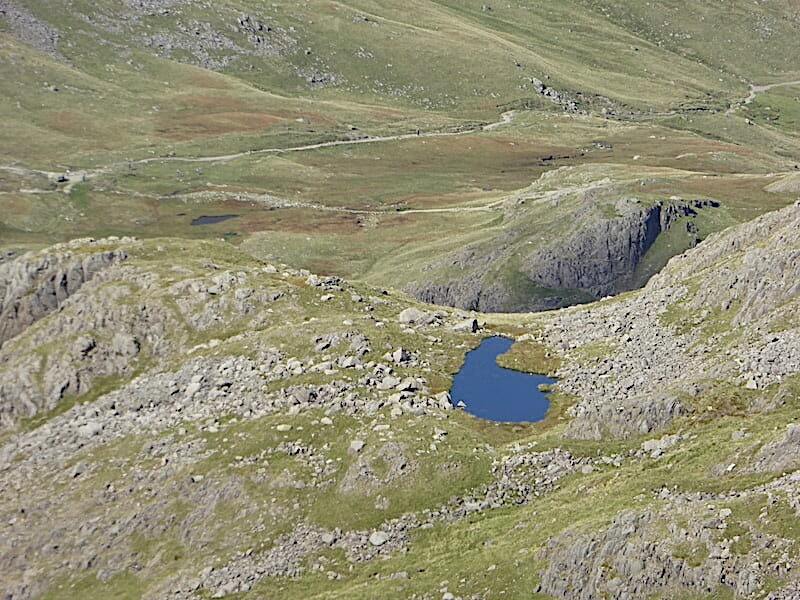 A little further to the right is the pretty little un-named tarn from where I took the view of Great Gable when we were walking up. 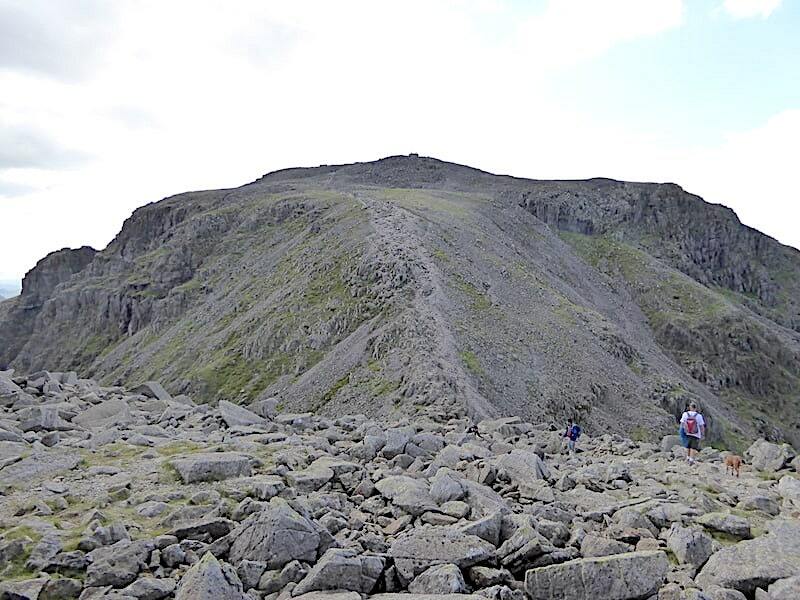 A look back at the descent route from Scafell Pike as we begin to climb Broad Crag. 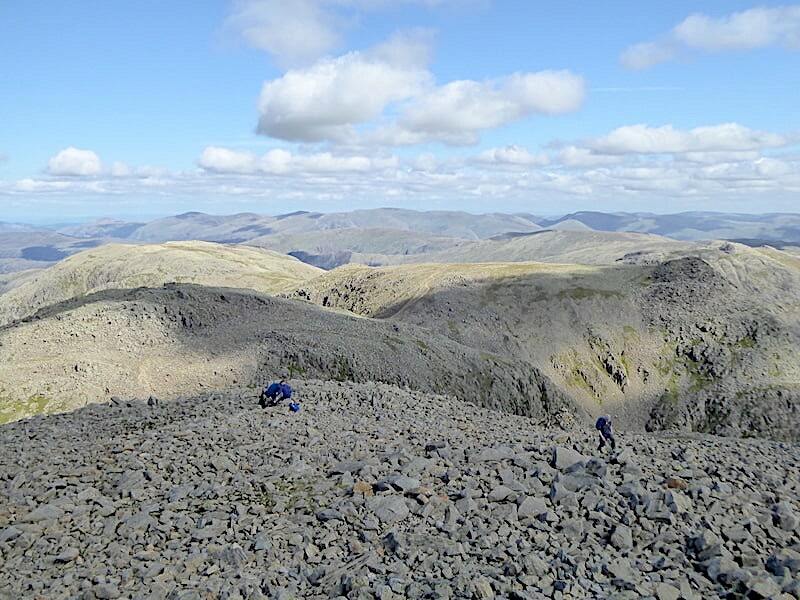 The man in the white t-shirt is heading down towards the col, the one in the blue jacket is none other than the Chinese chap watching his female companion crawling on all fours across the boulder field. He recognised us once again and gave us another smile and cheery wave. There’s no path as such and the lass was having a real struggle making her way over which made her progress was extremely slow. There’s nothing we can do to help so we leave them battling across and carry on over. 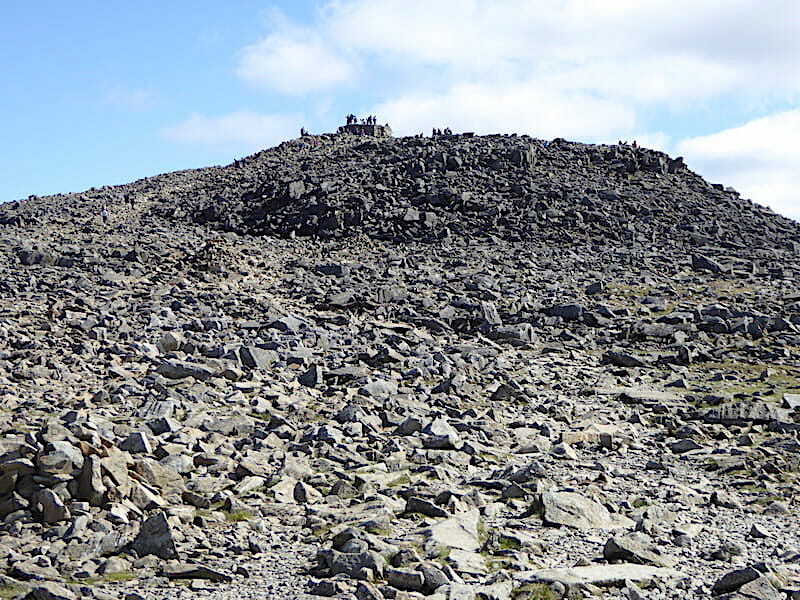 The line of cairns will guide them across. 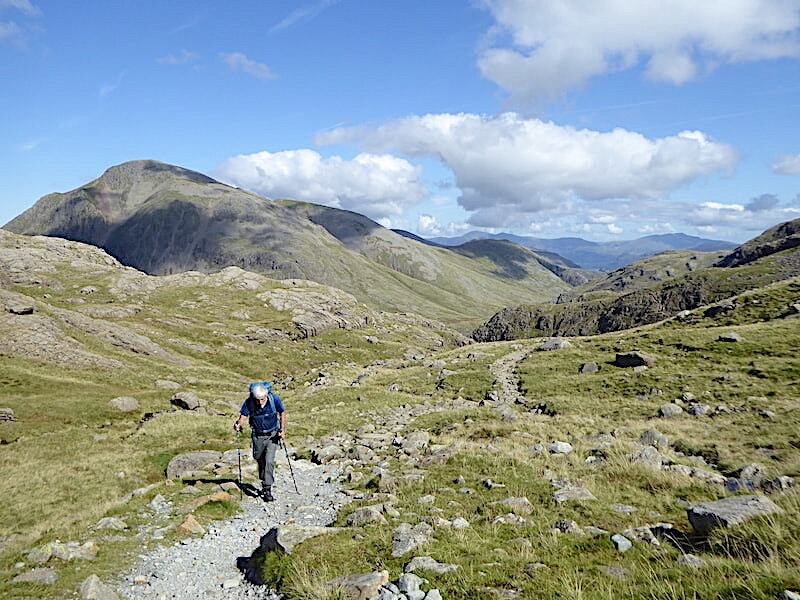 One struggle ends and another is about to begin as we reach the col between Broad Crag and Ill Crag. The group’s guide is already waiting at the bottom and the girl who has managed to keep up with him from the start is just about to join him. I looked back but the other two were nowhere to be seen, these two will have a long wait before they can continue up Ill Crag. A longer view to include Great End, presently in the sunshine. The girl is now talking to the guide while they wait, her dog starts to run down the gully to the left of where they are standing and creates a minor panic in its owner as she yells for it to come back, which it does eventually. 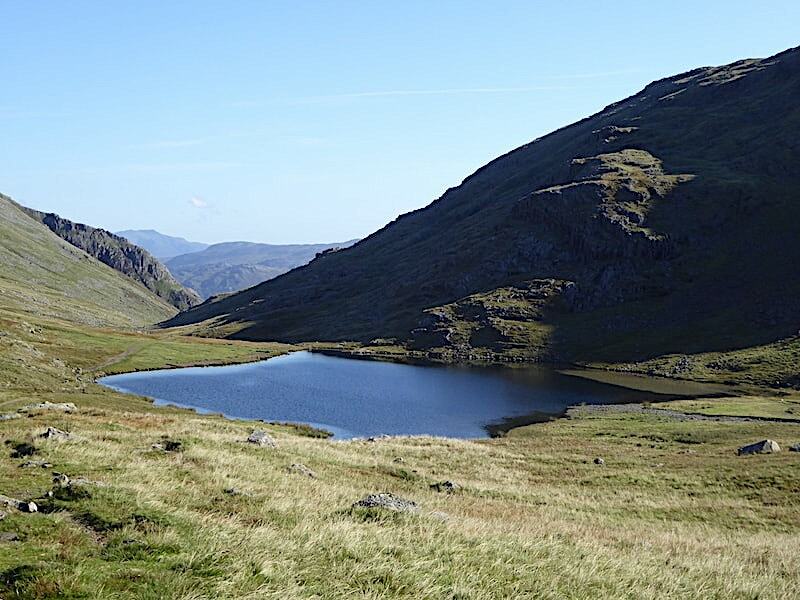 From the ascent of Ill Crag a peep down to Lambfoot Dub, another pretty little tarn situated in a little hollow high above the Corridor Route down below. 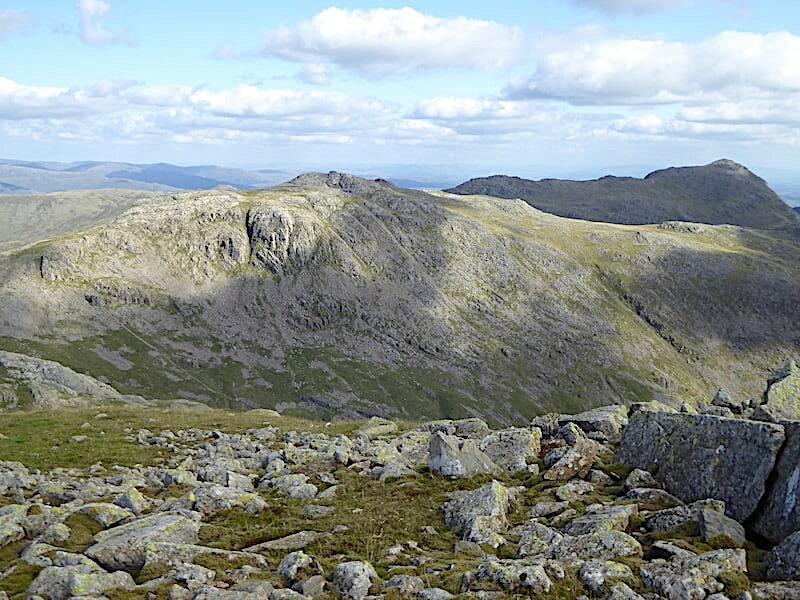 Towards the upper left corner of the shot the little grey dot in the patch of worn ground is the stretcher box at Sty Head, with the path from Seathwaite coming up to meet it. That’s the path we used this morning. A closer look at Lambfoot Dub. I can’t see that it bears much resemblance to a lamb’s foot though. We did think about making a detour to it as we passed below it this morning but didn’t in the end. Maybe we’ll get the chance to pay a special visit come the shorter autumn days. 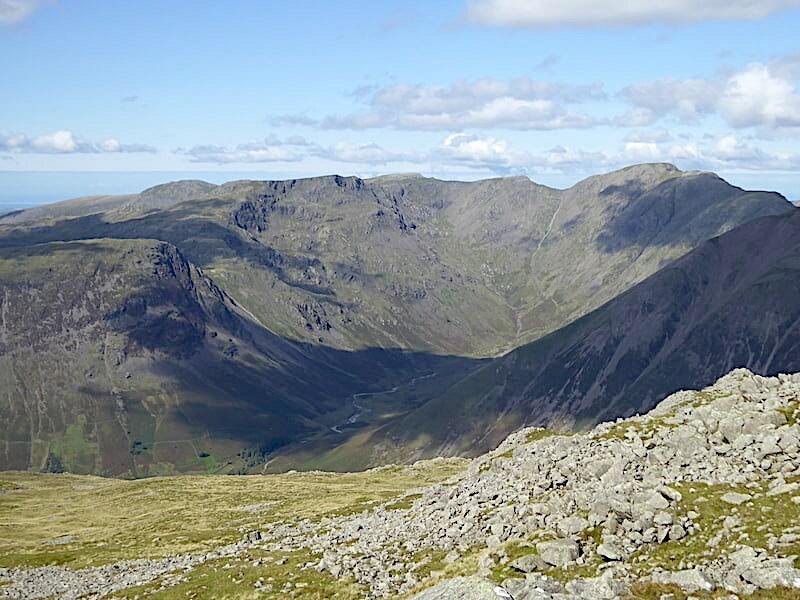 Lambfoot Dub nestling in the bottom right corner of this shot looking over at Great Gable and Green Gable, both of them looking very stately in the afternoon sun. A spectacular sight. 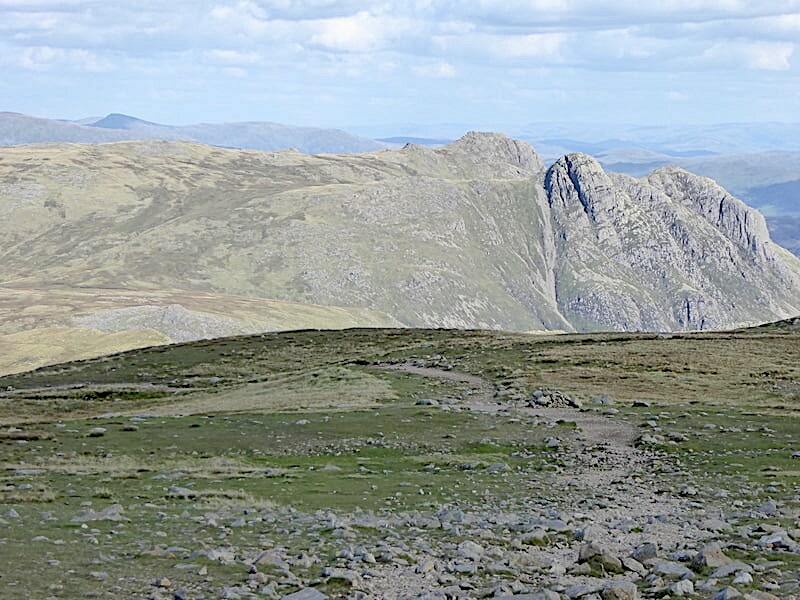 Looking back to Scafell Pike and Broad Crag as we continue up the Ill Crag path. Below us, but not in view in the shot, the guide and the young woman await the arrival of the other two members of the group. Looking back we could see no sign of them so they were still making heavy weather of the Broad Crag crossing. 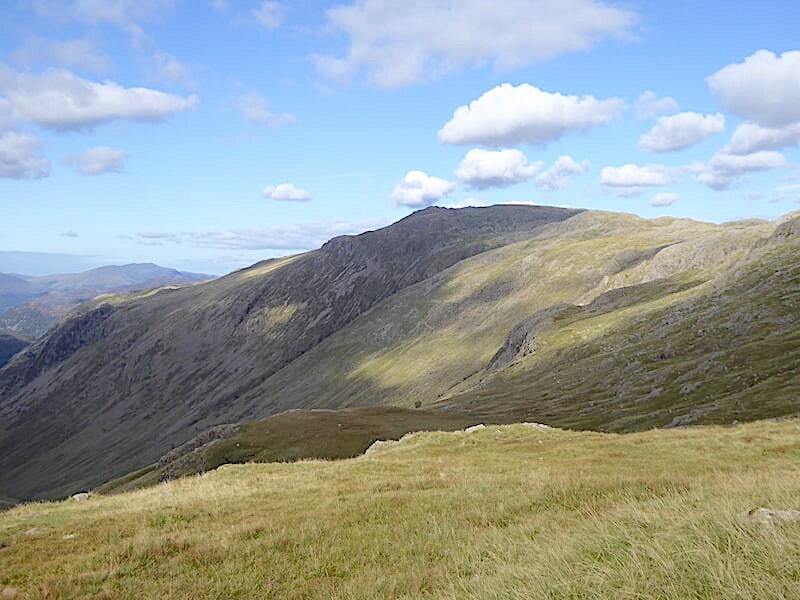 We’re almost at the top of the rise on Ill Crag now so a last look across at the fells to the west of us before they disappear from view, and what a lovely late summer day in which to enjoy them. 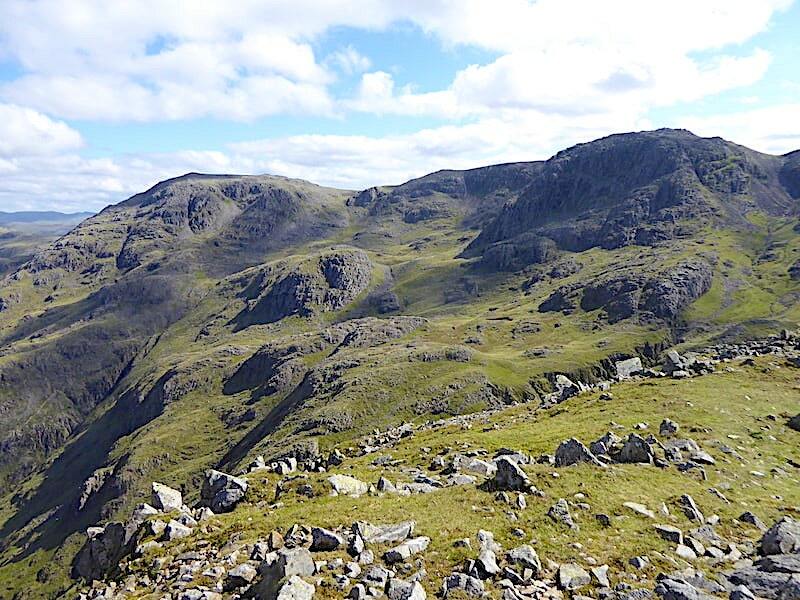 We didn’t bother going over to the top of Ill Crag either, the journey across to this point is even rougher than the one across Broad Crag. 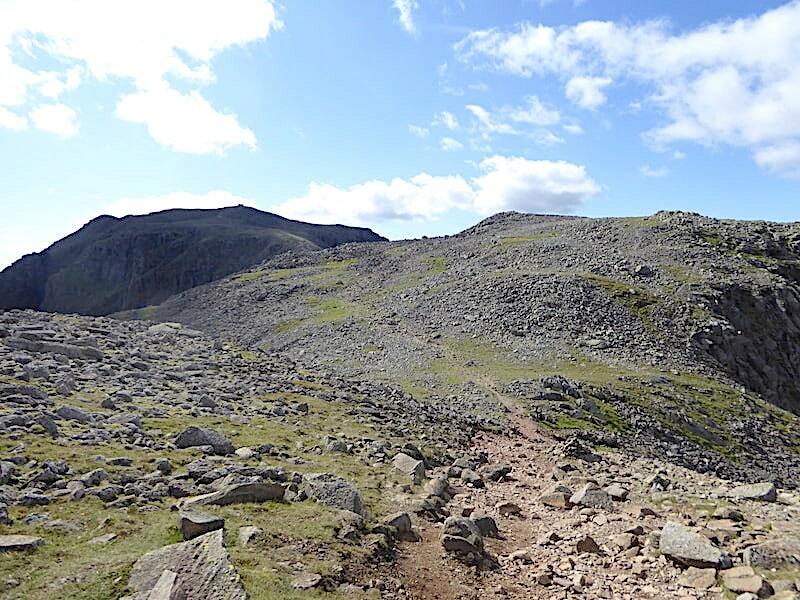 Besides which, leg tiredness is now beginning to kick in, largely brought about by all the boulder hopping we’ve had to do since our lunch break and the prospect of doing more of it in order to summit Ill Crag had somehow lost any appeal it might once have had. The view from it along Eskdale will have to wait for another day, for now we’re more than happy with this view of Esk Pike and Bowfell. We took a last look back before dropping down to see if the Chinese walkers had come into view once more but there was no sign of them and we didn’t see them again all the way back down. The path becomes very much less bouldery as it approaches Great End before dropping down onto a good pitched path down Calf Cove. We’re not going up Great End either, another patchwork of boulder, rock and scree to deal with is low on our list of priorities right now. We follow the pitched path down into Calf Cove, with its cross shelter over on the bottom left, and note that all along the path there are still plenty of walkers making their way up. 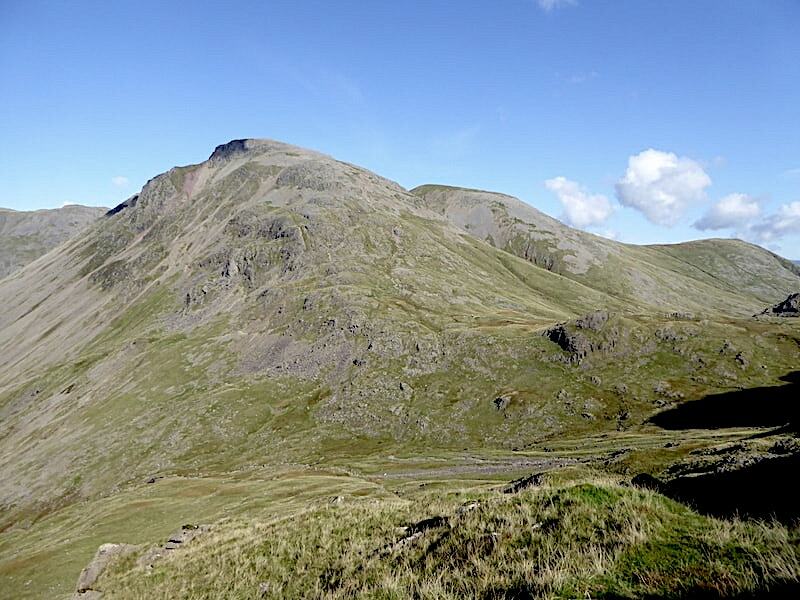 Still descending the Calf Cove path with this view of a sunny Esk Pike for company all the way along …..
….. together with this view, to our right, of Hard Knott and Harter Fell beyond Esk Pike’s long southern ridge …..
….. while to our left we have the sunny uplands of Allen Crags and Glaramara to gaze at. 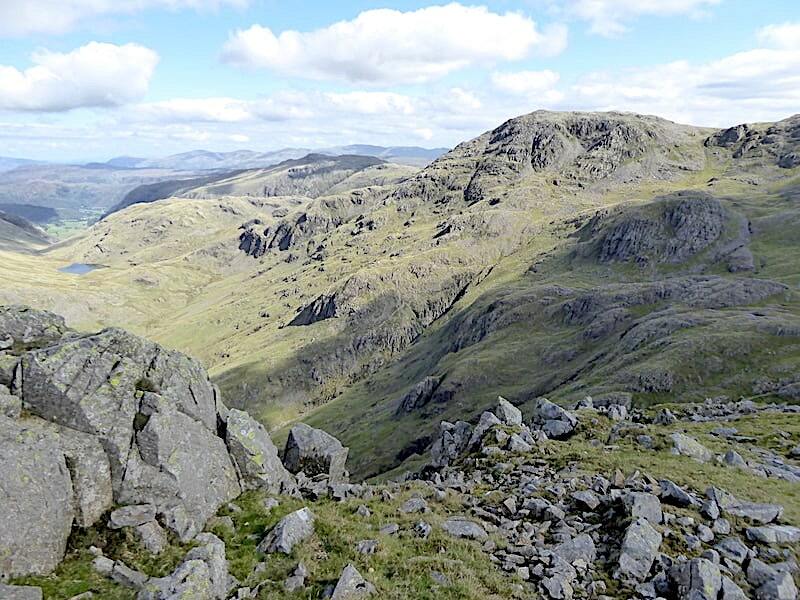 Still on the Esk Hause path and we’re passing below Esk Pike here where its the turn of the Langdale Pikes and Harrison Stickle to proudly present their steep craggy features to anyone who cares to look. 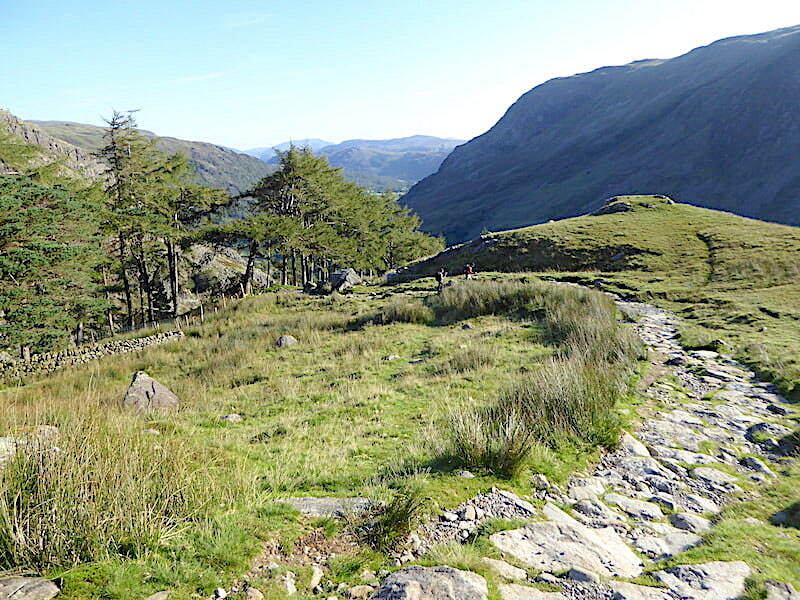 We leave the Esk Hause path and take a path off to the left which will lead us down to Ruddy Gill where we’ll pick up the Grains Gill path back down to Seathwaite. 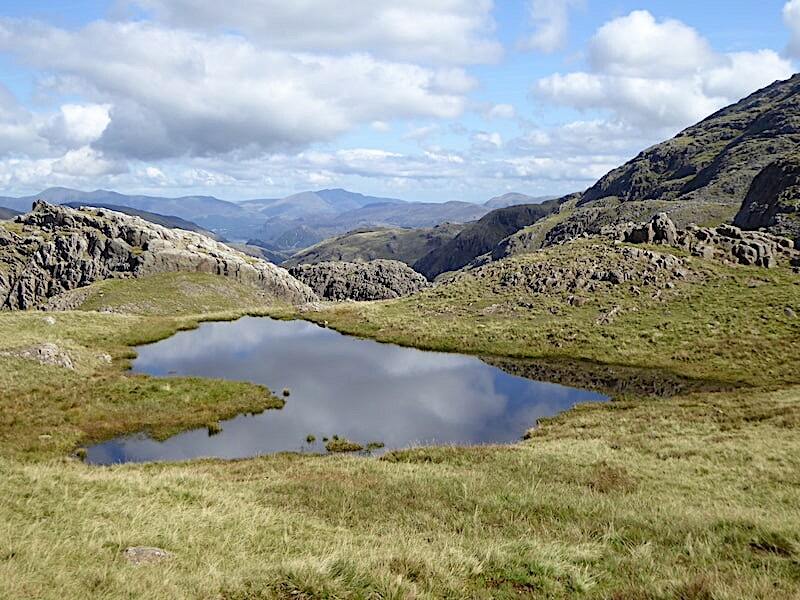 A smidge of Sprinkling Tarn is on view over to the left, with rather more than a smidge of Derwentwater showing up on the right. That long band of cloud has slowly been getting closer all day so that looks like tomorrow’s weather coming in. 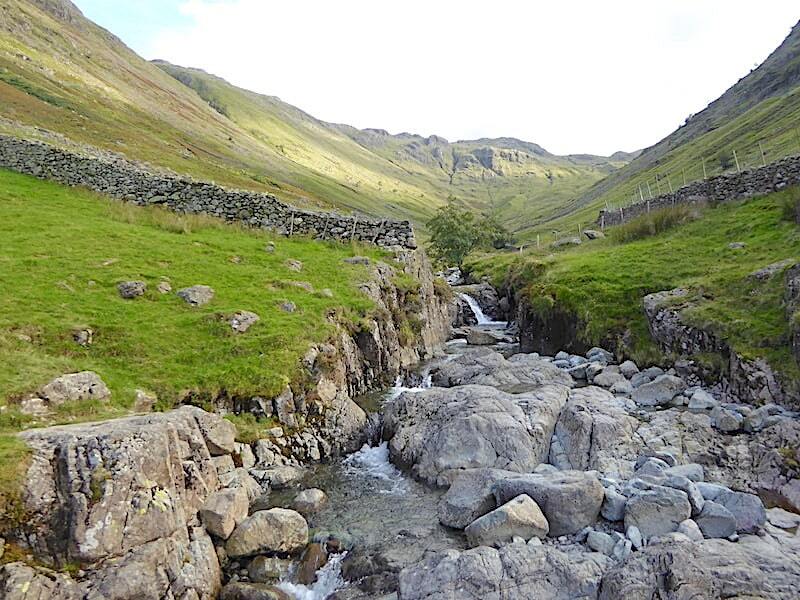 As we cross Ruddy Gill we’re in the shadow of Great End and as we haven’t had a rest break since leaving Scafell Pike we decided to take one as soon as we reach the sunnier patch beyond the gill. 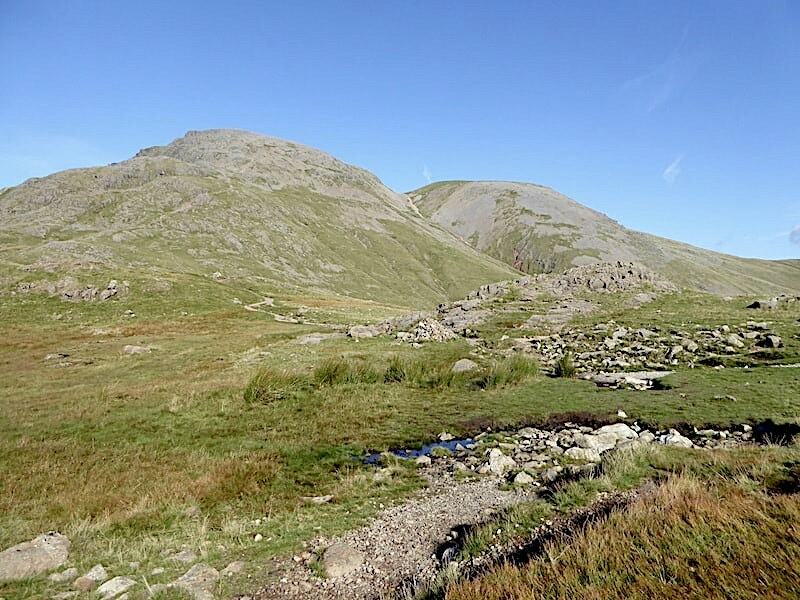 That should just about set us up for the long walk back down to Seathwaite. 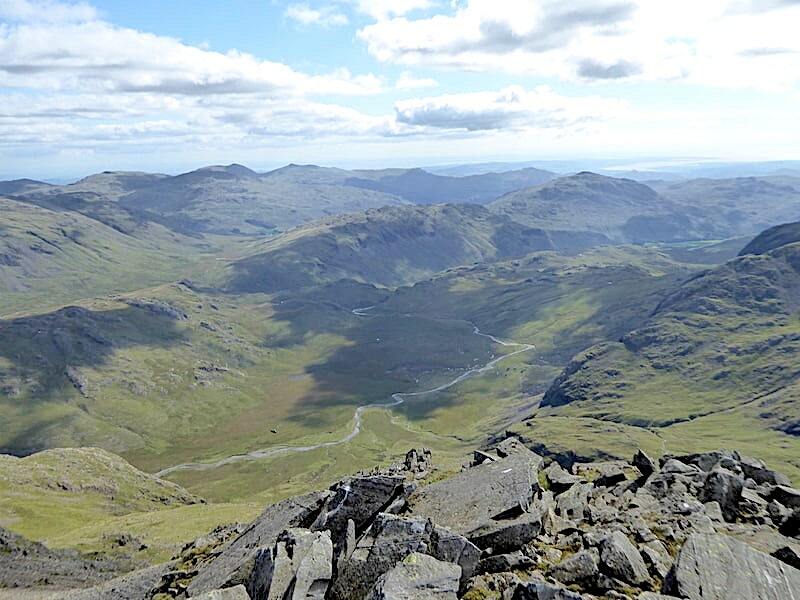 Perched comfortably on a couple of flat and friendly rocks out come a couple of sausage rolls and the drinks and we spend a very warm ten minutes or so refuelling just watching the clouds dappling the slopes of Glaramara as they drift gently by. 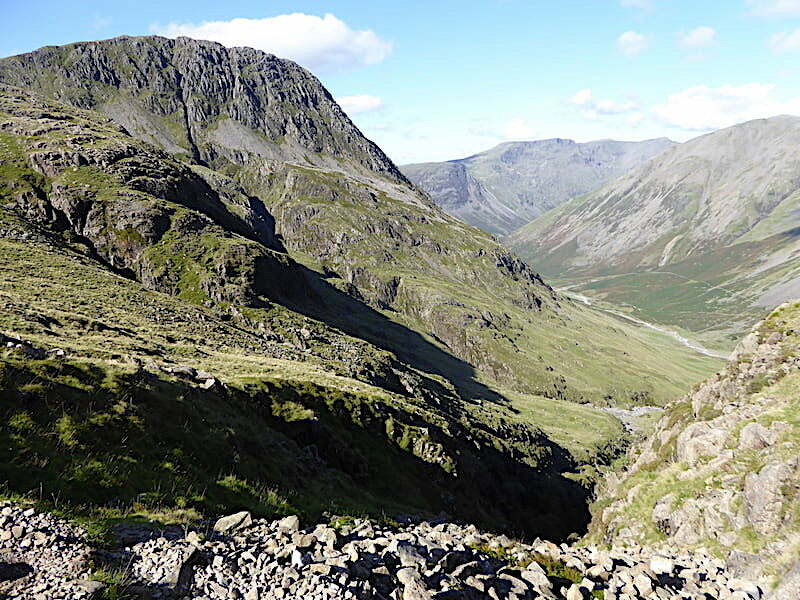 The lovely view down Grains Gill, through Borrowdale to the diminutive Castle Crag above Derwentwater with the entire view being brought to a full stop by the enormous extent of the Skiddaw massif. Fifty minutes later and we have come full circle and are back once more at Stockley Bridge from where I took this look back at the last section of today’s walk. Taking photographs around the bridge area was a chap from Somerset, together with his wife, who were in the Lake District for a week’s holiday. He was chatty, very jolly and had lots of questions and we spent well over thirty minutes in conversation with both of them so the timetable slipped a bit. No matter, its always good to chat to visitors and we weren’t in any rush to get back home. 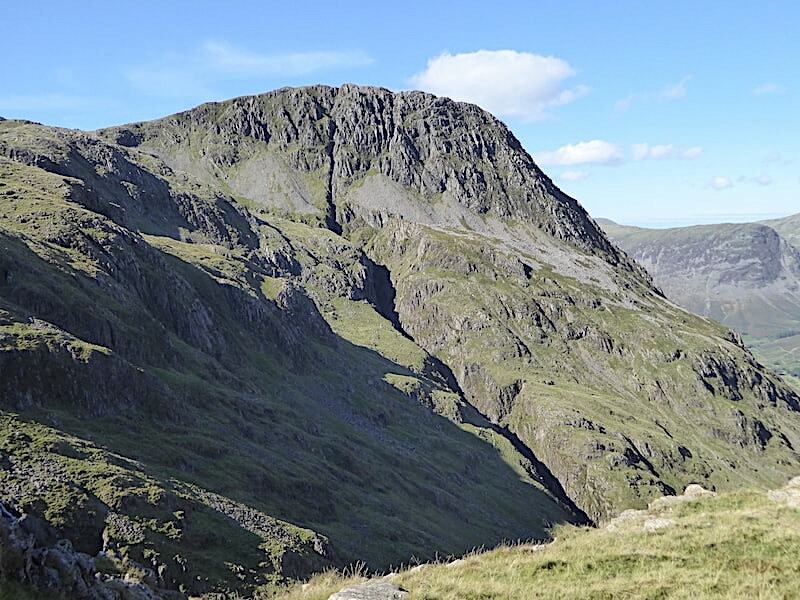 We eventually parted company and walked the last mile back to Seathwaite, having decided on the way back that we would stop off in Keswick and treat ourselves to fish and chips from our favourite chippy to round off a terrific day’s walking. AW ended many of his walks in this way so we’re in good company by doing exactly the same. 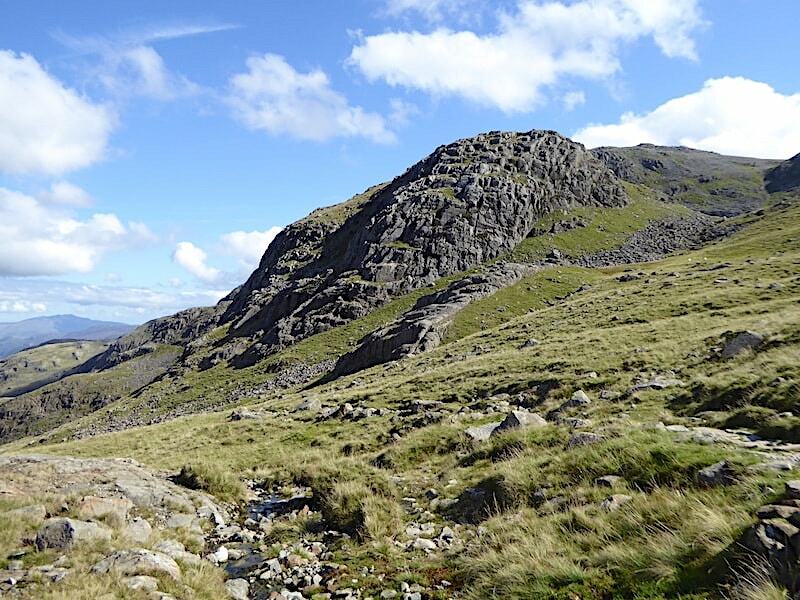 A first class and thoroughly enjoyable walk through beautifully rugged scenery with the added bonus of glorious weather which enabled us to view it at its very best.